The album "Stay On These Roads" was produced by Alan Tarney and includes a blue front cover with a picture of a-ha, some broken glass and string. There is a grey a-ha logo located in the top left-hand corner with a white handwritten title printed along the top of the sleeve. The album is available on CD, LP and cassette. The back of the LP is white with "There's never a forever thing" written down the left side on a blue strip. There is also a small colour picture of a butterfly resting on the palm of a hand and the tracks listed in blue. At the top left-hand corner of the back sleeve is a black barcode "0 7599-25733-1 3" with the Catalogue numbers for the LP UK: WX 166 925733-1 Ⓤ, cassette 925733-4 and compact disc CD: 925733-2 France: WE 381. There is a record company address, and some copyright, production and manufacturing information printed in charcoal near the bottom left of the back sleeve; "Warner Bros. Records Inc., a Warner Communications Company 3300 Warner Blvd., Burbank, Calif. 91510. 75 Rockefeller Plaza, New York, New York 10019. © 1988 Warner Bros. Records Inc. for the U.S. and WEA International Inc. for the world outside of the U.S. ℗ 1988 Warner Bros. Records Inc. for the U.S. and WEA International Inc. for the world outside of the U.S. All Rights Reserved. Unauthorized duplication is a violation of applicable laws. Manufactured in Germany. Presse en Allemagne. Record Service GmbH, Alsdorf A Warner Communications Company". A blue "WB RECORDS" logo is also included alongside. A Warner Music logo inscribed into the back sleeve is included near the bottom right-hand corner and includes some other LC 0392 coding printed alongside. The inner sleeve is white with a large blue and white band picture down one side and some of the song words down the other, the other side has a smaller blue and white band picture and the rest of the song words. The Catalogue number 925 733-1 UK: WX 166 is also included at the top of one side. The a-side of the record label is white with the track listing for both sides (including track lengths and track credits) printed in blue on half of the label, and the picture of a butterfly on a hand on the other half. The "GEMA/BIEM" symbol, "STEREO" Catalogue number 925 733-1 WX 166 are included in-between the track listing. Some other publishing information; "All songs published by (GB only) ATV Music except *SBK Songs Ltd./ATV Music." is included at the bottom along with a blue triangular 33 RPM symbol. The picture of a butterfly on a hand also includes a white "WB RECORDS" logo, LC 0392 coding and other black publishing text; "All songs published by ATV Music Corp. BMI except as indicated. ℗ 1988 Warner Bros. Records Inc.". Around the bottom rim of the label is some additional Copyright information; "ALL RIGHTS OF THE PRODUCER AND OF THE RESERVED. UNAUTHORIZED COPYING, LENDING, PUBLIC PERFORMANCE AND BROADCASTING OF THE RECORD PROHIBITED". The b-side of the label has just the colour picture of the butterfly in hand located in the centre of the label, with a blue "a-ha" logo and handwritten title "Stay on these roads" in white included above. The Catalogue number 925 733-1 WX 166 is also printed in white at the bottom. The album was re-issued again by "Record Service GmbH, Alsdorf" in Germany, but coming with a slightly darker coloured front and back cover sleeve, the grey a-ha logo and white handwritten title "stay on these roads" located along the top of the front sleeve has now been printed around two and a half centimetres further down from the top. The re-issue also now includes a seven centrimetre round light blue and white hype sticker advertising some of the hit singles included on the album and includes the Catalogue number; "INCLUDES THE HIT SINGLES STAY ON THESE ROADS THE BLOOD THAT MOVES THE BODY TOUCHY! YOU ARE THE ONE 925 733-1 WX 166". On the reverse of the sleeve, at the bottom left-hand corner, the manufacturing information; "Manufactured in Germany. Presse en Allemagne. Record Service GmbH, Alsdorf A Warner Communications Company." has been printed and displayed slightly differently compared to the first edition, mainly removing the large spacing. The inside of the album also contains the same inner sleeve and record as before, although the artwork and printing is again somewhat slightly darker in colour. The same barcode "0 7599-25733-1 3" and Catalogue numbers LP UK: WX 166 925733-1 Ⓤ, cassette 925733-4 and compact disc CD: 925733-2 France: WE 381 are used throughout. The original German made CD was "Manufactured in Germany by Record Service GMBH, Alsdorf" and includes a booklet insert, the front cover is like the LP but has "a digital recording" printed in blue along the bottom, the booklet contains all the track lyrics and 3 black and white pictures of a-ha. Some of the booklets also come with a misprint which has 2 blank pages with the lyrics for "The Living Daylights", "There's Never A Forever Thing", "Out Of Blue Comes Green" and "You Are The One". The back of the booklet is plain blue with "There's never a forever thing" written down one side. The Catalogue number 925733-2 is printed in white at the top right hand corner. The reverse of the CD is white with blue track listing and a colour picture of a hand holding a butterfly. There is some grey printed Production and Copyright text included; "Warner Bros. Records Inc., a Warner Communations Company® © 1988 Warner Bros. Records Inc. for the U.S. and WEA International Inc. for the world outside of the U.S. ℗ 1988 Warner Bros. Records Inc. for the U.S. and WEA International Inc. for the world outside of the U.S. All Rights Reserved. Unauthorized duplication is a violation of applicable laws" printed above the barcode. The Catalogue number 925733-2 France: WE 851 is shown at the top right hand corner in blue. The disc itself is silver with black titles and lists the tracks down the right hand side. There is some additional Production and Manufacturing information displayed on the left hand side of the disc; "℗ 1988 Warner Bros. Records Inc. for the U.S., a Warner Communications Company® Manufactured in Germany by Record Service GMBH, Alsdorf", along with some Copyright text which has been printed around the outer edge of the disc and is displayed in English, German & French. The text; "PRODUCED BY ALAN TARNEY", "WB RECORDS", "COMPACT disc DIGITAL AUDIO" and "GEMA/BIEM" logos, plus "LC0392" coding and Catalogue number 925 733-2 are included at the lower half of the disc. There is another German CD edition of Stay On These Roads which was again "Manufactured in Germany by Record Service GmbH, Aldorf". It is very similar to the earlier release, including the same Catalogue number 925733-2 France: WE: 851, but coming with a slight variation to the Copyright and Record Company information on the back sleeve, the information on this second pressing being slightly longer, showing some additional text; ""Warner Bros. Records Inc., a Warner Communations Company® © 1988 Warner Bros. Records Inc. for the U.S. and WEA International Inc. for the world outside of the U.S. ℗ 1988 Warner Bros. Records Inc. for the U.S. and WEA International Inc. for the world outside of the U.S. All Rights Reserved. Unauthorized Copying, Hiring, Lending, Public Performance And Broadcasting Of This Record Prohibited. Manufactured in Germany. Presse en Allemagne. Record Service GmbH. Alsdorf A Warner Communications Company" (and omitting ".. Unauthorised duplication is a violation of application laws.") which appears on the earlier release. This text and the "WB" logo are printed in lighter colours on this second pressing. The actual discs themselves are the same on both the first and second pressings, but some(?) of the pressings come with a different, 725733-2.4 RSA (Record Service GmbH, Alsdorf) matrix number on them, rather than the original 925 733-2 P+O-B (P+O Compact Disc GmbH & Co. KG). There is also a limited edition picture CD which comes with a unique sleeve. The front of the CD booklet is white with a group shot (Morten, Paul and Mags) with each of the band members holding a black guitar. The pink a-ha-logo is positioned in the middle at the top of the sleeve with the title in blue written across the logo. Below the title it reads "limited edition picture disc a digital recording" in small black letters. The reverse of the booklet is white with the track listing written in small blue letters in the centre and catalogue number 925733-6 in the top right hand corner. The rest of the CD booklet is the same as that of the regular release. The CD itself is white with a colour shot of the band members with their guitars, taken at the same photo session as the picture on the front, in the top half of the disc. The bottom half of the disc features the pink a-ha-logo with the blue title written across it and a track listing in black underneath. There is some Manufacturing and Production text printed in black on the left hand side; "℗ 1988 Warner Bros. Records Inc. for the U.S., a Warner Communications Company. Manufactured in Germany by Record Service GmbH. Alsdorf", whilst along the bottom edge of the disc, printed in blue, is some Copyright Information; "•ALL RIGHTS OF THE PRODUCER AND OF THE OWNER OF THE WORD REPRODUCED RESERVED. UNAUTHORIZED COPYING, HIRING, LENDING, PUBLIC PERFORMANCE AND BROADCASTING OF THIS RECORD PROHIBITED!•" The back insert of the CD is the same as the regular release apart from the additional Manufacturing text; "Manufactured in Germany • Fabrique en Allemagne. TELDEC Record Service GmbH A Warner Communications Company" printed above the barcode. The design of the barcode has also been slightly changed and includes a revised number "0 75992 57336". Later pressings of the CD and LP had sleeves similar to the USA release (see below). The catalogue numbers are also printed in a slightly different way. The German made cassette comes with a similar front cover to the LP release, but fuller in length with "Stay On These Roads" written at the bottom. It was "Manufactured in Germany by Record Service GmbH, Alsdorf". The spine and back sleeve is light blue and displays a picture of a butterfly with an open hand in the background. On the spine, a-ha is displayed landscaped in the centre printed in blue, with the title "stay on these roads" in black. The "WB Records" logo is again shown landscaped at the top with the catalogue numbers being; "UK:WX166C" for the UK, "925 733-4 Ⓤ" for Germany and "FRANCE WE 481" displayed orientated at the bottom. The back sleeve comes with a white barcode on the left hand side, with the full track listing to side 1 shown down the centre and side 2 down the right. Along the bottom, there is some manufacturing information; "Manufactured in Germany. Fabrique en Allemagne. Record Service GmbH, Alsdorf. A Warner Communications Company". The insert folds out to display the same butterfly picture and includes some track lyrics, the other side is pale grey and white, displaying an image of the three a-ha band members behind the rest of the track lyrics. On the reverse of the spine, there is a large black "WB Records" logo, with the regular "Warner Bros. Records Inc." contact address and Copyright text shown on the inside of the back sleeve. The tape is transparent clear with a grey centre piece and white printed text. The title "A-HA/STAY ON THESE ROADS" is shown at the top with the track listing to each side underneath. The "WB Records" and "GEMA/BIEM" logos, including the catalogue number "925 733-4 WX 166C" are displayed on the left with side 1/2 and the "DOLBY NX-pro B-NR" logo on the right. Along the bottom of side 1, it displays some Copyright information; "All rights of the producer and of the owner of the work reproduced reserved. Unauthorized copying, hiring, public performance and broadcasting of this recording prohibited", and along the bottom of side 2, it shows some Production text; "PRODUCED BY ALAN TARNEY ℗ 1988 Warner Bros. Records Inc. for the U.S. & WEA International for the world outside of the U.S.". There is an "AIWA" 3 track album sampler "TapetoTape" cassette. It cmes with a light blue insert with the "TapetoTape" logo in black at the top of the tracks (album versions of "Stay On These Roads", "The Blood That Moves The Body" and "Touchy!") type printed below. "CHROME - 23.03.88" is also printed on the sleeve. The cassette itself is a regular black TDK SA 60 with the songs recorded on side A only. Side A of the cassette has a light blue label over the top of the TDK label with "A-HA (3 tracks)", "TapetoTape" logo and an address type printed in black. Tracks: Stay On These Roads (4:44) / The Blood That Moves The Body(4:05) / Touchy! (4:31) / This Alone Is Love (5:13) / Hurry Home (4:34) // The Living Daylights (4:46) / There's Never A Forever Thing (2:49) / Out Of Blue Comes Green (6:40) / You Are The One (3:48) / You'll End Up Crying (2:06). The Argentine LP comes with a lighter blue sleeve compared to the U.S. release, The titles are additionally printed in Spanish as "Quedate En Estos Caminos" at the bottom left hand corner of the front sleeve, with an additional "wea" logo printed in white at the top right. The back sleeve is white with blue and purple text and displays the full track listing and different credits in Spanish. The regular open hand picture with the butterfly and handwritten text; "There’s never a forever thing" is shown as usual down the left hand side. There is some Spanish Production text; "℗ 1988 Warner Bros. Records Inc. para los Estados Unidos & WEA International Inc. para el resto del mundo" again printed in blue and displayed near the lower half of the black sleeve. Along the bottom, there is a "wea discos s.r.l" logo, with some additional Spanish manufacturing and copyright information printed in black; "Una Compania Grupo Warner Communications. Prohibida la reproduccion, locacion y prestamo de este ejemplar y su radiodifusion o ejecucion publica. Reservados todos los derechos de los autores de las obras y del productor de fonogramas". The catalogue number 80743 is displayed at the top right hand corner in blue and comes without a barcode, plus the "WB Records" logo is shown at the bottom left. The record labels are white with black text and displays the colour "WB Records" logo at the top, the title "QUEDATE EN ESTOS CAMINOS" is shown underneath along with "a-ha (Interprete) Producido por Alan Tarney". Displayed on the lower half of the labels on each side is the full track listing again shown in Spanish, plus some Production text; "℗ 1988 Warner Bros. Records Inc. para los EE.UU. & WEA Int. Inc. para el resto del mundo" and catalogue number 80743. Around the outer edge of the label at the top it displays some Spanish manufacturing and distributing information; "PUBLICADO POR WEA discos s.r.l. FABRICADO Y DISTRIBUIDO POR EMI-ODEON SAIC San Martin 3590 – Florida (Pcia. De Bs. As. )", with some additional Spanish Trademark text;"MARCA REGISTRADA SADAIC-BIEM". Around the bottom edge, there is instead some Spanish copyright information; "RESERVADOS DERECHOS DE LOS AUTORES, INTERPREY PRODUCTORES FONOGRAFICOS SOBRE OBRAS GRABADAS EN ESTE DISCO. PROHIBIDA SU REPRODUCCION PUBLICA O PRIVADA, ALQUILER, CANJE O EJECUCION PUBLICA". The release doesn't include an inner lyric sleeve. Some copies of the LP were used for 'promotional purposes only' and come the regular sleeve, but include the additional wording "VENTA PROHIBIDA PROMOTIONAL" (Promotional Prohibited Sale) stamped in yellow across the record label on side 1. There are two different pressings of the Argentina cassette, both have titles in Spanish "QUEDATE EN ESTOS CAMINOS" but include different catalogue numbers. The inserts are similar, black with the regular cover shot printed at the top of the sleeve. The titles are shown in white below the picture, along with the "WB Records" and "wea" logos. The first pressing comes with the catalogue number 4-25733 and includes a white "H" printed on the spine. The track listing is also displayed in Spanish on the back cover along with "Industria Argentina". The inside of the insert is coloured white with black text; it includes the full track listing in both Spanish and English. There is some Spanish production text which reads; "(P) 1988 Warner Bros. Records Inc. para los Estados Unidos & WEA International Inc. para el resto del mundo". On the inside of the back cover, it displays "SADAIC-BIEM – AADI-CAPIF" along with some Spanish copyright information; "Wea discos s.r.l. Una Compania del Grupo Warner Communications" and trademark information; "INDUSTRIA ARGENTINA – MARCAS REGISTRADAS". The "Dolby B" text is also included and is printed and displayed on the inside of the spine in Spanish. The first pressed tape using catalogue number 4-25733 is cream with brown printed text and was released by "EMSSA", it includes the title and track listing in Spanish at the top, with some copyright information at the bottom; "Prohibida la reproduccion, locacion y prestamo de este ejemplar y su radiodifusion o ejecucion plublica. Reservados todos los derechos de los autores de las obras y delproductor de fobogramas". The "wea discos s.r.l", "WB Records" and "DOLBY SYSTEM" logos are also present, along with the catalogue number 4-25733, "SADAIC-BIEM AADI-CAPIF" and "INDUSTRIA ARGENTINA". The second pressing comes instead with the catalogue number 90743 and comes otherwise with the same insert as the first pressing, the "DOLBY SYSTEM" logo on the front cover now includes the full wording printed alongside, which wasn’t displayed on the front cover of the first pressing, and there is no additional "H" shown on the spine. At least two slightly different issues of the tape were manufactured, the first edition was released by "EMI" and comes with a cream tape with brown printed text, the layout and design is virtually the same as the first pressing but the catalogue number on the left hand side of the tape has changed to 90743. The second issue was released by "EMSA" and comes instead with a white tape with brown printed text. The same layout and design is used and is otherwise exactly the same as the first "EMI" issue, including the same catalogue number 90743 being displayed on the left hand side. The Australian LP of "Stay On These Roads" comes with the regular front and back cover artworks and is like the U.S. release. On the back sleeve, there is no barcode included in the top right hand corner, but instead displays both Catalogue numbers for the Australian LP 25733-1 and Cassette 25733-4 album releases. The regular full track listing and text; "Also Available on Cassette and Compact Disc" is displayed in the usual blue and located around the centre of the sleeve, with the regular picture of the open hand with the butterfly and handwritten text; "There’s never a forever thing" down the left hand side. At the bottom left hand corner printed in grey is the usual Warner Bros. Records contact address details and copyright information which appears on the U.S. edition, but the text "Made in U.S.A." has been omitted, just leaving an empty space instead; "Warner Bros. Records Inc., a Warner Communications Company ® 3300 Warner Blvd, Burbank, Calif 91510. 75 Rockefeller Plaza, New York, New York 10019. © 1988 Warner Bros. Records Inc. for the U.S. and WEA International Inc. for the world outside of the U.S. ℗ 1988 Warner Bros. Records Inc. for the U.S. and WEA International Inc. for the world outside of the U.S. All Rights Reserved. Unauthorized duplication is a violation of applicable laws". There is also some other additional Australian manufacturing text (again printed in grey), but in a smaller sized font at the bottom left of the back sleeve which reads; "Made in Australia by WEA Retail Pty Limited as Austrailian Copyright owner A Warner Communications Company", plus the regular blue "WB RECORDS" logo which is also included alongside. The inside of the LP comes with the regular inner sleeve similar to the U.S. edition, displaying the same album artwork pictures and full track lyrics. Although located at the bottom of one side underneath the track lyrics for "you’ll end up crying" and the "ATV Music Corp" copyright text is some other additional "For Australia & New Zealand lyrics reprinted by permission of SBK Songs. SBK Catalogue Partnership" information. The record itself (like the sleeve) comes with both labels similar to the U.S. release showing the standard artwork, it includes the full track listing as usual (printed in blue) on one half of the a-side, with the picture of the butterfly on a hand on the other half. Some revised Publishing information "All songs published by SBK Songs except as indicated" and the regular white "WB Records" logo is also included. At the bottom of the a-side, it shows the same Australian manufacturing information, which appears on the back sleeve, plus some additional copyright information printed again in blue around the outer rim; "ALL RIGHTS OF THE MANUFACTURER AND OF THE OWNER OF THE RECORDED WORK RESERVED. UNAUTHORISED PUBLIC PERFORMANCE, BROADCASTING, LEASING AND COPYING OF THIS RECORD PROHIBITED. WEA RECORDS PTY. LIMITED A WARNER COMMUNICATIONS COMPANY". The Catalogue number 25733-1 is on display at the bottom of each side, but additionally includes an additional reference number MX300949 underneath, which differs compared to the back sleeve. The Australian cassette was "Marketed by WEA Records Pty Limited", the front cover comes with the usual regular front cover artworks with the a-ha logo printed in grey at the top and the title "stay on these roads" handwritten in white at the bottom. The spine is the same as the regular release but additionally includes the "DOLBY SYSTEM" logo and a different catalogue number 25733-4. The back sleeve is coloured lilac and displays the full track listing to each side in black; it is much larger than the regular release and doesn’t include a barcode. The inside of the insert folds out to include the usual track lyrics, the colouring inside has been printed in light grey rather than white, to make the images of the band members stand out clearer and some of the publishing text has been changed to read; "All songs published by SBK Songs except "The Living Daylights" SBK Songs/SBK Cat P/Ship". The inside of the spine displays the "WB Records" logo, catalogue number and "also available on compact disc". The inside of the back sleeve contains the usual "Warner Bros. Records Inc." Record Company address, "Dolby B" and Australian Marketing information. The tape is transparent clear with a grey centre, the track listing to each side is shown at the top and the title "STAY ON THESE ROADS" at the bottom. The "Marketed by WEA Records Pty Limited, A Warner Communications Company" information is included on side 1 and "All rights reserved." displayed on side 2. The Brazilian LP release was manufactured and distributed by "BMG ARIOLA DISCOS LTDA." and is similar to the UK pressing, it comes with the same front cover artworks showing the title "a-ha" in grey and "Stay on these roads" in white along the top, the catalogue number 670.4135 is additionally included in the top right hand corner. On the reverse of the sleeve, the layout is again very similar to the UK release including the usual full track listing being printed in blue in the centre, with the regular picture of the open hand with the butterfly and handwritten text; "There’s never a forever thing" down the left hand side. There is no barcode included at the top right hand corner but comes instead with some other Brazilian text; "STEREO 00314 TAMBEM EM CASSETTE" which displays that it was also available on cassette. The blue "WB Records" logo is also shown on the lower left of the sleeve. Along the bottom, there is some Brazilian manufacturing and distributing information displayed in blue; "Fabricado e Distribuido por BMG ARIOLA DISCOS LTDA. – Av Eng Billings. 2.227 – Sao Paulo – CGC 56.697.162/0002-66 SCDPDPF 50/87 – S. Paulo – Industria Brasileira – Sob licence de WEA DISCOS LTDA.". The inside of the sleeve comes with an additional inner cardboard lyric sheet which displays the regular track lyrics and artworks, the catalogue number has also been included but the usual copyright text; "© 1988 Warner Bros. Records Inc. for the U.S." has been omitted. The record comes with the regular artwork labels but some of the text including the "a-side" and "b-side" has been printed in Portuguese to read "ESTE LADO" and "OUTRO LADO". On the a-side, the full track listing to each side is displayed in blue on one half of the label, with each track additionally including an 8-digit reference number. There is also some production text; "produzido por alan tarney and C.G.C. – 56.697.162/0002-66" displayed in-between the track listing. At the bottom, it also shows; "(P) 1988 warner bros. records inc." and the catalogue number. The other half of the label has the regular picture of the open hand with the butterfly and a white "WB Records" logo. The b-side of the label includes the same open hand with the butterfly image, blue "a-ha" logo and title "Stay on these roads" in white. Along the bottom edge of the label, it again includes the catalogue number but printed this time in pink, along with some additional Brazilian manufacturing and distributing information; "Fabricado e distribuido por BMG ARIOLA DISCOS LTDA. – Av. Engenheiro Billings. 2227 – C.G.C 56.697.162/0002-66 – SP – Todos os direitos reservados Ind.Brasileira – WEA DISCOS LTDA. Rua Itaipava, 44 – Jardim Botanico – Rio de Janeiro – RJ – C.G.C. 42.470.112/0001-56 – Censura – Protocolo Geral № 273". The first CD pressing in Brazil was manufactured by "MICROSERVICE" and distributed by "BMG Ariola Discos Ltda", it doesn't include a barcode or any manufacturing information on the back sleeve; it's otherwise very similar to the European release and comes with the usual artwork and an insert booklet with lyrics. The disc is silver with black text, the usual a-ha logo and title "STAY ON THESE ROADS" is displayed at the top, some Brazilian Production information is included on the left hand side which reads; "(P) 1989 Distribuido pela BMG Ariola Discos Ltda. CGC 56 697 162/0002-66 SCDPDF 50/87 Sao Paulo – Ind. Brasileira Sob Licenca de WEA Discos Ltda". Along the bottom edge of the disc is some additional Brazilian manufacturing information; "Fabricado pela MICROSERVICE – Microfilmagens e Reproducoes Tecnicas Ltda, CGC 43 359 926/0001-80 – Sao Paulo". The full track listing is shown down the right hand side, but each track includes an eight digit reference number. The usual "COMPACT DISC DIGITAL AUDIO" and "WB" logos are included on the disc and back sleeve. The Catalogue number is 759925733-2. The second "MICROSERVICE" pressing was again distributed by "BMG Ariola Discos Ltda", it is similar to the first pressing and now comes with some manufacturing information on the back sleeve; "FABRICADO PELA MICROSERVICE – MICROFILMAGENS E REPRODUCOES TECNICAS LTDA C.G.C 43.359.926/0001-80 SAO PAULO – IND. BRASILEIRA – DISTRIBUIDO PELA BMG ARIOLA DISCOS LTDA C.G.C. 56.697.162/0002-66 SCDPDPF 50/87 SAO PAULO – IND. BRASILEIRA SOB LICENCA DE WEA DISCOS LTDA". The same front cover insert booklet and disc which was used on the first Microservice pressing is included. There is an additional "FLAP F" silver hologram sticker on the front of the CD case and engraved additionally onto the back is the "MICROSERVICE Ⓡ" logo. The same Catalogue number 759925733-2 is used. There is also a gold stamped issue of the "Microservice" second pressing which was used for promotional purposes and comes with an additional circular gold "AMOSTRA BMG INVENDAVEL" stamp on the back sleeve. The third made "MICROSERVICE" CD album was instead released by "Warner Music Brasil Ltda." and comes with a multi-coloured branded "BEST SELLERS" sticker on the front of the CD case, the usual "FLAP F" silver hologram sticker is also present. The layout and design is similar to the earlier "MICROSERVICE" releases, but now includes a barcode and some different manufacturing information on the back sleeve; "(C) WARNER BROS. RECORDS INC. – WARNER MUSIC BRASIL LTDA C.G.C. 42.470.112/0001-56 – FABRICADO PELA MICROSERVICE MICROFILMAGENS E REPRODUCOES TECNICAS DA AMAZONIA LTDA. NA ZONA FRANCA DE MANAUS C.G.C 34.525.444/0001-62 INDUSTRIA BRASILEIRA – DISTRIBUIDO PELA WARNER MUSIC BRASIL LTDA. C.G.C. 42.470.112/0012-09". The regular insert booklet has also been included but the Catalogue number 759925733-2 on the back cover has been printed in white. The actual disc is again silver with black text, but is slightly different compared to the earlier MICROSERVICE pressings, the Production Information on the left hand side has been changed to; "(P) 1988 Warner Bros. Records Inc. for the U.S., a Warner Communications Company". Along the bottom edge of the disc, the Manufacturing Information is also different, it reads; "WARNER MUSIC BRASIL LTDA., TODOS OS DIREITOS RESERVADOS – PROIBIDA A EXECUCAO PUBLICA – RADIOTELEDIFUSAO E LOCACAO – FABRICADO PELA MICROSERVICE C.G.C. 34.525.444/0001-62 INDUSTRIA BRASILEIRA". The usual "WB" and "COMPACT DISC DIGITAL AUDIO" logos are as usual displayed on the disc and back sleeve. There is another Brazilian CD release of "Stay On These Roads" which was manufactured instead by "Videolar" and again distributed by "Warner Music Brasil Ltda", it is similar to the earlier third pressed "MICROSERVICE" release and includes the same front and back cover Artworks, it also comes with the silver "FLAP F" hologram sticker on the front of the CD case. The usual insert booklet is also included. There is a white barcode displayed on the black sleeve and some manufacturing and distributing information which differs compared to the earlier "MICROSERVICE" pressings, it also additionally includes a Website address; "http://www.warnermusicbrasil.com.br – Warner Music Brasil Ltda. – Fabricado na Zona Franca de Manaus por Videolar Multimidia Ltda. – Av. Solimoes, 505 Distrito Industrial CGC 22.797 .096/0001-01 – Industria Brasileira Distribuido pela Warner Music Brasil Ltda. CGC 42.470.112/0012-09". The disc is again silver with black text and includes the usual layout, the Manufacturing and Distributing information has now been displayed around the outer top rim of the disc; "FABRICADO POR VIDEOLAR ® - INDUSTRIA BRASILEIRA – SOB LICENCA DE WARNER MUSIC BRASIL LTDA. CGC: 42.470.112/0012-09". The "WB" and "COMPACT DISC DIGITAL AUDIO" logo are included but have now been printed in bold on the disc. The Catalogue number is again the same as before. The second pressed Brazilian "Videolar" CD release is similar to the earlier release and comes with the same front and back cover artworks and lyric booklet. On the front of the CD Case the smaller Silver "ifpi" hologram sticker is now displayed compared to the earlier pressings which use the "FLAP F" hologram stickers. The disc itself is exactly the same as the one used on the earlier first "Videolar" release and is again silver with black text. On the back sleeve it again includes the white barcode in the bottom left hand corner. The manufacturing and distributing information has again been changed to read; "Warner Music Brasil Ltda., uma empresa Warner Music Group. Produzido no Polo Industrial de Manaus por Videolar S.A. Av. Solimoes, 505 – Distrito Industrial Manaus – AM – CNPJ 04.229.761/0004-13 – Industria Brasileira. Distribuido pela Warner Music Brasil Ltda. – CNPJ 42.470.112/0012-09 – www.warnermusic.com.br". There is also an additional "PRODUZIDO NO POLO INDUSTRIAL DE MANAUS CONHECA A AMAZONIA" Flying Amazon Bird logo displayed on the back sleeve, along with the usual "WB" and "COMPACT DISC DIGITAL AUDIO" logos. On the spine of the CD case and around the centre ring of the disc, we have some additional batch issue coding which is AA0001000. The Catalogue number remains unchanged. There is a third Brazilian "Videolar" made CD release which is very similar to the previous "Videolar" releases and again comes with the exact same disc throughout. There is no silver hologram sticker on the front of the CD case and the release also comes with the usual insert booklet. On the back sleeve, the manufacturing and distributing information has again been slightly amended compared to the earlier "Videolar" release; Warner Music Brasil Ltda., uma empresa Warner Music Group. Produzido no Polo Industrial de Manaus por Videolar S.A. Av. Solimoes, 505 – Distrito Industrial Manaus – AM – CNPJ 04.229.761/0004-13 – Industria Brasileira, sob encomenda da Warner Music Brasil Ltda – CNPJ 42.470.112/0012-09. Distribuido pela Warner Music Brasil Ltda. – CNPJ 42.470.112/0012-09 – www.warnermusic.com.br". The usual "PRODUZIDO NO POLO INDUSTRIAL DE MANAUS CONHECA A AMAZONIA" Flying Amazon Bird, "WB" and "COMPACT DISC DIGITAL AUDIO" logos are included on the back sleeve. On the spine of the CD case and around the centre ring of the disc, we have the additional batch issue coding which is AC0002500. The cassette was manufactured and distributed by "BMG ARIOLA DISCOS LTDA." and differs from the European release. The front of the insert is blue with the regular artwork in the centre with a white border. The title is printed in silver capital letters above with the "Dolby system" logo at the bottom. The spine and back insert is orange with black text. The track listing is displayed in English on the back sleeve along with its own 8 digit number; it also displays some Production text; "Produzido por Alan Tarney (P) 1988 Warner Bros. Records Inc. and Musica e Cultura". On the spine the title "A-HA STAY ON THESE ROADS" is printed in the centre. The "WB" logo with its own 6 digit reference number is on the left and both catalogue numbers to the LP – 670.4135 and cassette – 767.4135 releases are on the right. The "Dolby-B" is also included. The insert comes without any lyrics. The first pressed cassette is cream with brown printed text; it was issued by "BMG". The full track listing with credits is shown at the top, some Brazilian record company information is shown at the bottom of side 1, it reads "WEA DISCOS LTDA Rua Italpava, 44 - Rio de Janeiro - RJ CGC 42470112/0001-56 SCDP-SR/GB/DPE 273/76". On side 2 there is instead some Brazilian manufacturing and distributing information displayed at the bottom which reads "Fabricado e Distribuido por BMG ARIOLA DISCOS LTDA. Av Eng. Billings, 2227 – Sao Paulo – CGC 56.697.162/0002-66. SCDP DPF 001/69 – S. Paulo – Industria Brasileira – Sob licence de WEA DISCOS LTDA.". The usual "WB" logo, "Dolby-B" and catalogue number 761.4135 is also present. The second pressed cassette is also cream, but comes instead with a grey stick-on label printed with black text. It was also issued by "BMG". The layout and design is otherwise exactly the same as the first pressing. There is also some gold stamped issues of the "BMG" cassette which were used for promotional purposes and include a circular gold "AMOSTRA BMG INVENDAVEL" stamp on the front cover. "Stay On These Roads" was available on LP in Bolivia, it appears to come with a darker purple coloured front sleeve than the regular release, displaying the usual colour artwork and title "a-ha stay on these roads" handwritten along the top in grey. The back sleeve is white with a lighter shade of blue in the artwork, displaying the regular open hand picture with the butterfly and handwritten text; "There’s never a forever thing" down the left hand side. The remainder of the back sleeve is printed in light blue to include the full track listing as usual in the centre of the sleeve. There is no barcode included, but instead displays the Catalogue number WL-1043 in the top right-hand corner. Along the bottom of the back sleeve, there is some logoed text; "DISCO IS CULTURA" instead of the usual "WB RECORDS" logo. There is also some additional manufacturing and printing company information printed in Spanish at the bottom right-hand corner; "MANUFACTURADO POR "DISCOLANDIA, DUERI Y CIA. LTDA. BAJO LICENCIA DE WEA Internacional - CAS. 422 - TELS. 356656 - 328513 - LA PAZ - BOLIVIA INDUSTRIA BOLIVIANA. IMPRESO POR OFFSET "DISCOLANDIA". The record comes with white lined labels and black printed text. There is a colour "wea" logo at the top of each side, with A-HA in black underneath. On the left hand-hand side is the Catalogue number WL-1043, with "33 R.P.M. ", "stereo||compatible||mono" and "LADO A" or "LADO B" on the right-hand side. At the lower half of each side is the title "Stay on these roads" and full track listing which include track credits to John Barry, M. Harket, Mags and Pal Waaktaar. It also includes track lengths to each one. There is some additional production text; "P) 1988 WARNER BROS RECORDS Inc.". Around the outer rim of the label (again on both sides) is some Spanish manufacturing and copyright information; "MANUFACTURADO POR INDUSTRIAS FONOELECTRICAS "LYRA" LA PAZ - RESERVADOS TODOS LOS DERECHOS DEL PRODUCTOR FONOGRAFICO Y DE LOS AUTORES DE LAS OBRAS REGISTRADAS EN ESTE DISCO - PROHIBIDA SU REPRODUCCION, EJECUCION PUBLICA Y/O RADIOTELEDIFUSION - INDUSTRIA BOLIVIANA -". The record appears not to include an inner lyric sleeve. There is a Canadian LP release which was "Manufactured by Columbia House in Canada" and comes with a similar front and back sleeve to the U.S. edition. There is no barcode included on the back sleeve and the regular U.S. "Warner Brothers Records" information at the bottom left hand corner has been replaced instead with some Canadian Manufacturing and Copyright text; "Manufactured by Columbia House, a division of CBS Records Canada Ltd. Fabrique par Columbia House, une division de CBS Disques Canada Ltee, 815 Middlefield Road, Scarborough, Ontario, M1V 3M3. Unauthorized copying of this recording strictly prohibited". The blue "WB Records" and black "CRC" logos are including alongside. The back sleeve also comes with the usual white background, it includes the regular track listing in the centre and comes with the additional text; "Also Available on Cassette and Compact Disc" in blue underneath. The picture of the open hand with the butterfly and handwritten text; "There’s never a forever thing" is displayed down the left hand side. The inside of the LP comes with the inner sleeve similar to the U.S. release displaying the same artworks and full track lyrics printed in blue. The "CRC" logo is additionally shown underneath the track lyrics for "Touchy! ", plus the Copyright text and Catalogue number on the right hand side has been amended to read; "© 1988 Warner Bros. Records Inc. for the U.S. W1 25733". On the spine, all of the text is printed in dark blue, the Catalogue number W1 25733 is displayed on the left hand side, with the title "a-ha STAY ON THESE ROADS" and reference coding "571075" near the centre. On the right hand side, "LITHO IN CANADA" and "WARNER BROS. RECORDS INC." are shown. The record itself comes with both labels similar to the U.S. and "WEA Music of Canada Ltd" releases showing the standard artwork, it includes the full track listing (printed in a lighter blue though) on one half of the a-side, with the picture of the butterfly on a hand on the other half. The regular Publishing information "All songs published by ATV Music Corp, BMG except as indicated ℗ 1988 Warner Bros. Records Inc. for the U.S." and white "WB Records" logo is included. In-between the track listing on the a-side, the same manufacturing information is displayed in a darker blue which appears on the back sleeve, plus the Canadian "Columbia House" Catalogue number W1 25733, "CRC" and "CR" logos are also shown on the right hand side. At the top and bottom of the label, there are two dark blue rectangular boxes which have been used to blank out the distributing text and Catalogue number which is used on the "WEA Music of Canada Ltd" edition. The b-side of the label includes the colour picture of the butterfly in hand, blue "a-ha" logo and white handwritten title; "Stay on these roads". The revised catalogue number W1 25733, "CRC" and "CR" logos, plus another dark blue rectangular box covering up the "WEA Music of Canada Ltd" Catalogue number is displayed at the bottom. There is another LP release of "stay on these roads" which was distributed instead by "WEA Music of Canada Ltd" and comes with a similar front and back sleeve to the Canadian "Columbia House" edition. The regular barcode has now included on the back sleeve but the usual U.S. "Warner Brothers" Record Company information at the bottom left hand corner has again been amended to include some different Canadian distributing information; "DISTRIBUTED BY/DISTRIBUE PAR/WEA MUSIC OF CANADA LTD./WEA MUSIQUE DU CANADA LTEE, 1810 BIRCHMOUNT ROAD, SCARBOROUGH, ONTARIO, A WARNER COMMUNICATIONS COMPANY®". The regular "Warner Bros. Inc." Copyright text is also shown but doesn’t include the wording; "Made in U.S.A.", just leaving a gap in-between. The "WB Records" logo and that the LP is "Also Available on Cassette and Compact Disc" in blue has also been included on the back sleeve. The inside of the LP comes with the same inner sleeve as the U.S. and Canadian "Columbia House" editions but doesn’t include the "Warner Bros. Records Inc." Copyright text or Catalogue number on the right hand side. On the spine, the layout is slightly different compared to the Canadian "Columbia House" edition, the title "a-ha STAY ON THESE ROADS" is now displayed on the left hand side again in blue, with the Catalogue number 92 57331 in the centre and both the text; "PRINTED IN CANADA" and "WARNER BROS. RECORDS INC." shown on the right. The record itself comes again with both labels similar to the standard U.S. and Canadian "Columbia House" LP releases showing the regular artwork on both sides, the full track listing is again printed in the lighter blue on one half of the a-side, with the usual picture of the butterfly on a hand on the other half. The regular Publishing information "All songs published by ATV Music Corp, BMG except as indicated ℗ 1988 Warner Bros. Records Inc. for the U.S." and white "WB Records" logo is also included. At the top of the label on the a-side, it displays a different Catalogue number 92 57331 compared to the "Columbia House" release, plus the same distributing information which is included on the back sleeve is printed in light blue at the bottom. On the b-side, the Catalogue number is again shown at the bottom of the label but this time in white. The Canadian CD album was distributed by "WEA Music of Canada Ltd". and is similar to the European edition, it includes the regular artworks and same colour booklet. There is some Canadian production and copyright information on both the sleeve and disc; "℗ © 1988 Warner Bros. Records Inc. for the U.S. and WEA International Inc. for the world outside of the U.S. All Rights Reserved. Unauthorised reproduction of this recording is prohibited by law and subject to criminal prosecution. Distributed by/Distribue par WEA Music of Canada Ltd./WEA Musique du Canada Ltee. 1810 Birchmount Rd., Scarborough, Ontario. A Warner Communications Company". The catalogue number is shorter, CD 25733. It comes with a glossier booklet than the European edition and the catalogue number is also printed in black on the back page. The cassette release in Canada was manufactured and distributed by "WEA Music of Canada Ltd", it comes with the regular front and back cover artworks. On the back sleeve the barcode is displayed in the centre with the track listing shown on either side. There is some copyright and Canadian distributing information along the bottom which reads; "Unauthorised reproduction of this recording is prohibited by law and subject to criminal prosecution. Distributed by/Distribue par WEA Music of Canada Ltd./WEA Musique du Canada Ltee. 1810 Birchmount Rd., Scarborough, Ontario. A Warner Communications Company". On the spine it additionally includes the "DOLBY HR PRO" logo and displays the catalogue number 92 57334. The inside of the insert folds out to include the full track lyrics and "Dolby B" information. 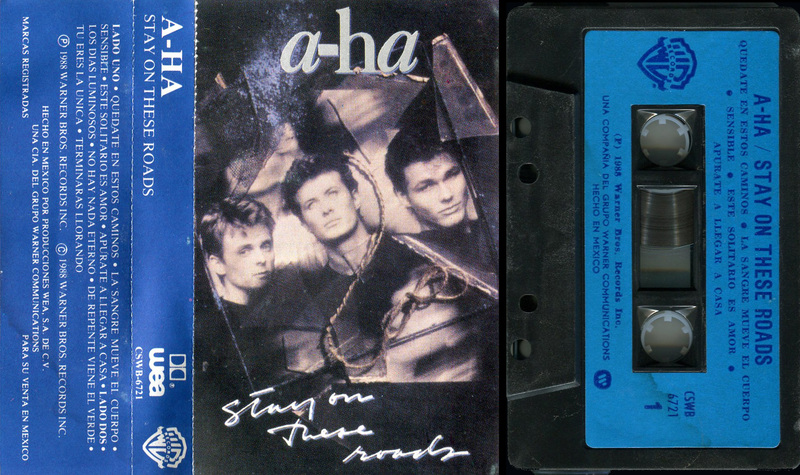 The tape is black with silver printed text, it displays the title "a-ha / Stay On These Roads" at the top with the track listing shown underneath. The "WB Records" logo and catalogue number is shown on the left hand side with the "DOLBY HR PRO" and Side 1/2 on the right hand side. Along the bottom of Side 1, there is some production text which reads; "PRODUCED BY ALAN TARNEY ℗ 1988 Warner Bros Records Inc for the U S", whilst along the bottom of Side 2; it displays the same distributing information which appears on the back sleeve. At the top right hand corner of each side of the tape it has "MADE IN CANADA" engraved into the plastic. The "wea" logo is also engraved into the clear plastic spine of the cassette case. The cassette release of "Stay On The Roads" comes with the title "Quedate En Esos Caminos". The front cover comes with the usual album artworks printed in the centre with the silver "a-ha" logo at the top and the Spanish title handwritten at the bottom in white. The "WB Records" logo is also shown at the bottom right hand corner. The back cover is white with black printed text and displays the full track listing in Spanish. Side 1 and Side 2 are shown as "Lado 1" and "Lado 2". Along the bottom, there is some Spanish Dolby Information; "Este cinta ha sido procesada con la caracteristica DOLBY tipo B Reduccion de Ruido. Durante la reproduccion se debe conectar el interruptor DOLBY N R. Si el equipo no tiene interruptor DOLBY, aduste el Control de Agudos si fuere necesario". The spine is yellow with black text, the title "A-HA QUEDATE EN ESOS CAMINOS" in printed (rather than handwritten) in the centre with the "WB Records" logo at the top and the "DOLBY" logo, Catalogue number 195200 and "STEREO" at the bottom. The inside of the insert is white with black text, listing all the tracks in both Spanish and English. There is also some manufacturing and distributing information which reads "Fabricado y distribuido por EMI Odeon Chilena S.A. Santiago – Chile". On the reverse of the spine is some Spanish copyright information along with a "FOTOMECANICA 5551492 GIMO-CROMIA "HERCAL" S.A." logo. The first pressing comes with a white tape with a white/cream stickered label and black printed text, it displays the title and track listing in Spanish at the top and the some manufacturing, distributing and Spanish copyright information at the bottom. On the left hand side, it displays Side 1/2 and the "DOLBY" logo, whilst on the right hand side, the "WB Records" logo, Catalogue number 195200 and "STEREO" are shown. The second pressing comes with the exact same insert as the first pressing which was again manufactured and distributed by "EMI Odeon Chilena S.A.". The colour of the tape is now tinted with a grey centre and white printed text, the actual layout, detail and font size of the text has been slightly changed. The title "A-HA – QUEDATE EN ESOS CAMINOS" is shown in uppercase at the top with the Spanish track listing underneath. On the left hand side, the "WB Records" and "DOLBY" logos are displayed along with "STEREO", on the right hand side, Side 1/2 and the Catalogue number 195200 are shown. At the bottom of side 1, the manufacturing and distributing information is displayed; "FABRICADO Y DISTRIBUIDO POR EMI ODEON CHILENA S.A.", whilst at the bottom of side 2, its been replaced instead with "©(P) 1988 WARNER BROS. RECORDS INC.", some Spanish copyright information is also included at the bottom of both sides; "RESERVADOS TODOS LOS DERECHOS DEL PRODUCTOR FONOGRAFICO Y DE LOS TITULARES DE LA OBRA GRABADA, PROHIBIDAS LA REPRODUCCION Y REGRABACION DE ESTE CASSETTE Y SU UTILIZACION PARA LA EJECUCION PUBLICA Y RADIOTELEDIFUSION". The Colombian LP release of "Stay On These Roads" was manufactured by "SONOLUX" and comes with the same front cover as the US edition displaying the regular album artworks. The back sleeve is coloured white with the usual blue track listing to each side displayed in the centre with the text; "Also Available on Cassette and Compact Disc" printed underneath. The regular open hand picture with the butterfly and handwritten text; "There’s never a forever thing" is included as usual down the left-hand side. Along the bottom of the back sleeve on the left-hand side is a blue "WB RECORDS" logo and Catalogue number 23(1031)00054 printed in grey underneath. There is also some grey printed Spanish production text; "℗ 1988 Warner Bros para USA y WEA Int. para el resto del mundo" included along the bottom centre with some other Spanish manufacturing and copyright information; "FABRICADO POR SONOLUX S.A. MEDELLEN - COLOMBIA. BAJO LECENCIA DE WEA INTERNATIONAL INC. TODOS LOS DERECHOS RESERVADOS. PROHIBIDA LA REPRODUCCION, EJECUCION PUBLICA Y RADIODIFUSION. AFILIADO A ASINCOL." located on the bottom right. There is no barcode included on the sleeve. The record itself comes with white labels and black printed text, it includes the colour WB RECORDS logo at the top and title "STAY ON THESE ROADS A-HA" underneath. On the left-hand side, it displays the Catalogue number 23(1031)00054 with "Lado 1" or "Lado 2" on the right-hand side. At the lower half of the label below the centre ring, is the full track listing to each side including track credits. Some Spanish production text; "Produced by Alan Tarney. Warner Bros. para USA; y WEA Int. para el resto del mundo. ℗ 1988 Sonolux" is also included. Around the bottom rim of each side and displayed in bold is the same manufacturing and copyright information which appears on the back sleeve. The album doesn’t appear to include an inner sleeve. Limited numbers of the LP came with a free band poster. It is a 55cm x 55cm black and white poster of the band members, wearing leather jackets and standing in front of an old fashioned silver microphone - the same poster which came with limited numbers of the 12" single of "Stay On These Roads". The first E.U. pressing is similar to the first "German Record Service GmbH, Alsdorf" made pressing and comes with the same back sleeve displaying the same Catalogue number 925733-2 France: WE 851. The Manufacturing and Copyright text is also the same; "Warner Bros. Records Inc., a Warner Communications Company ® Ⓒ 1988 Warner Bros. Records Inc. for the U.S. and WEA International Inc. for the world outside of the U.S. Ⓟ 1988 Warner Bros. Records Inc. for the U.S. and WEA International Inc. for the world outside of the U.S. All Rights Reserved. Unauthorized duplication is a violation of applicable laws". The regular black barcode and blue "WB" logo is displayed at the bottom left hand corner. The usual colour lyric booklet is included but the catalogue number on the back page has now been printed in full 7599-25733-2. The disc itself is very similar to the first German pressing but comes with a different matrix number (925 733-2 P+O-C) and the text "Manufactured in Germany by Record Service GmbH, Alsdorf" on the disc has been changed to "Made In Germany". The Catalogue number at the bottom centre of the disc has again been printed in full 7599-25733-2. The second E.U. pressing is very similar to the earlier pressing but now includes the full catalogue number 7599-25733-2 France: WE 851 displayed at the top right hand corner of the back sleeve, the same 7599-25733-2 number is additionally shown on the spine . The Manufacturing and Copyright text on the back sleeve is also the same as on the first German/E.U. pressing and includes the black barcode and blue "WB" logo. The regular colour lyric booklet is also included. The disc comes with a different matrix number 925733-2.4 RSA and again has the full catalogue number printed at the bottom. There was a re-issue of the European Stay On These Roads CD album which comes instead with another different Catalogue number 7599-25733-2 WE 835, the French part being WE 835 rather than the usual WE 851, and matrix number around the centre ring of the disc now displays; (759925733-2 WME), the text; Made In Germany" as usual is shown on the left hand side. The Catalogue number on the back sleeve doesn't include the word "France" printed before the number WE 835. Some copies of the album also come with an additional yellow round exclamation sticker on the front of the case. There is a another pressing which has a different matrix number (759925733-2.3 V01 OVB) on the disc. There are multiple pressings of this edition and the darkness of the colours differ. The track listing and "WB" logo are printed in black, rather than blue with some different Record Company and Copyright information; "Warner Bros. Records Inc., a Warner Communications Company ® Ⓒ 1988 Warner Bros. Records Inc. for the U.S. and WEA International Inc. for the world outside of the U.S. Ⓟ 1988 Warner Bros. Records Inc. for the U.S. and WEA International Inc. for the world outside of the U.S. All Rights Reserved. Unauthorised copying, hiring, lending, public performance and broadcasting of this recording prohibited!". It also states that it was "Made in the E.U.". The Catalogue number, usually displayed in the top right hand corner of the back sleeve has been omitted. The full catalogue number 7599-25733-2 is also printed on the spine, but there is no additional French number printed on the cover or disc. The Greek LP release is similar to the US edition but comes with a darker front sleeve displaying the usual album artworks. The back sleeve is off white and includes the usual track listing in the centre with the text; "Also Available on Cassette and Compact Disc" in blue underneath. The regular open hand picture with the butterfly and handwritten text; "There’s never a forever thing" is shown as usual down the left hand side. At the bottom left hand corner, the usual U.S. Record Company contact address and Copyright information is printed in black text and reads; "Warner Bros Records Inc., a Warner Communications Company ® 3300 Warner Blvd, Burbank, Calif. 91500. 75 Rockefeller Plaza, New York, New York 10019. © 1988 Warner Bros. Records Inc. for the U.S. and WEA International Inc. for the world outside of the U.S. ℗ 1988 Warner Bros. Records Inc. for the U.S. and WEA International Inc. for the world outside of the U.S. All Rights Reserved. Unauthorized duplication is a violation of applicable laws". Unlike the U.S. release, the text "Made in U.S.A" has been omitted and just leaves a gap in-between. A blue "WB Records" logo is additionally included. Along the bottom of the back sleeve, printed also in blue is some Greek manufacturing information; "WEA RECORDS S.A. MESSOGEION 319 HALANDRI MITROPOLEOS 51 SALONICA MADE IN GREECE". There is also some other Greek text displayed in the bottom right hand corner; "ΕΚΤΥΠΩΣΗ ΟΡΦΑΝΟΣ ΣΚΑΛΤΣΑΣ" which refers to where the LP was Printed. The record label itself comes with the regular layout with the a-side being in white with the tracks for both sides being shown in dark blue on half of the label, and the picture of a butterfly on an open hand with a white "WB-logo" on the other half. There is also some additional manufacturing text; "Mfd by G.P.I s.a. Made in Greece" printed in light blue, with the catalogue number 925733-1 included at the bottom. The b-side of the label just shows the colour picture of the butterfly in hand, dark blue "a-ha" logo and title "Stay on these roads" handwritten in white. The catalogue number is again displayed at the bottom. The release appears not to include an inner sleeve. The front and back cover of the cassette is red with the "WB" logo and title "A-HA STAY ON THESE ROADS" printed in black text, the usual LP album artworks is displayed in the centre. At the bottom of the front cover it additionally shows "STEREO" and the "DOLBY SYSTEM" logo. The sleeve folds out single-fold to include the full track listing on both the back cover and on the inside. The back cover also displays that the cassette was "MARKETED AND DISTRIBUTED BY WEA RECORDS S.A. GREECE". There is some additional DOLBY-B; "Η κασσέτα αύτή έχει ήχογραφηθή χρησιμοποιώντας τό σύστημα DOLBY-B πού μειώνει τόν θόρυβο. Αν τό κασσετόφωνό σας έχει ήση σύστημα DOLBY, άρκεϊ νά ηατήσετε τόν άναλογο σιακόπτη Αλλιώς, έάν χρειάζεται, έλαττώοτε τά πρίμα (TREBLE)". "(This musiccassette has been recorded using Dolby-B-type noise reduction equipment. On a Dolby equipped deck switch Dolby noise reduction <>. On non-Dolby equipment treble setting may be reduced if necessary.>>)" and copyright information; "ΜΕ ΤΗΝ ΕΠΙΦΥΛΑΞΗ ΚΑΘΕ ΔΙΚΑΙΩΜΑΤΟΣ ΤΗΣ ΠΑΡΑΓΩΓΟΥ ΕΤΑΙΡΙΑΣ, ΑΠΑΓΟΡΕΥΕΤΑΙ Η ΑΝΕΥ ΑΔΕΙΑΣ ΑΝΤΙΓΡΑΦΗ, ΑΝΑΠΑΡΑΓΩΓΗ, ΔΑΝΕΙΣΜΟΣ, ΔΗΜΟΣΙΑ ΕΚΤΕΛΕΣΗ, ΕΝΟΙΚΙΑΣΗ ΚΑΙ ΡΑΔΙΟΕΚΠΟΜΠΗ". "(WARNING: ALL RIGHTS RESERVED. UNAUTHORIZED COPYING, REPRODUCTION, HIRING, LENDING, PUBLIC PERFORMANCE AND BROADCASTING PROHIBITED.)" displayed on the inside of the back cover, both shown in English and Greek. 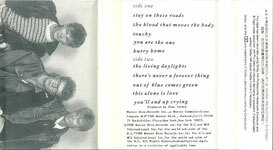 The tape itself is light grey with a white stickered label and black text, the title "A-HA-STAY ON THESE ROADS" is shown at the top with the track listing to each side underneath. There is a large "WB Records" logo displayed at the top left hand corner, "AEPI (P) 1988" is on the left and "STEREO" and side 1/2 is on the right. The catalogue number 925733-4 is included at the bottom left hand corner. At the bottom of side 1, there is some copyright information printed in English which is slightly different compared to the inside of the back sleeve, it reads; "All rights of the producer and of the owner of the work reproduced reserved. Unauthorised copying, hiring, lending, public performance and broadcasting of this tape prohibited". On side 2, the same copyright information is shown but in Greek; "Μέ τήν έηιφύλαξιν ήαντός όικοιώμοτος τού ηαραγωγοϋ καί τοϋ ίόιοκτήτου τοϋ έργου, άηαγορεύεται ή άντιγραφη, δημοαια έκτέλεσις καί ραόιεκηομηή της ηαρούσης ήχογραφήοεως". The text; "MFD by G.P.I. S.A. 410" is additional included at the bottom right hand corner of side 2. Some sealed copies of the cassette additionally come with a official blue/greyish signed I.F.P.I. anti-piracy seal. There is a Promotional Hong Kong LP release of "stay on these roads" which comes with a similar front and back cover sleeve to the U.S. edition and displays the same Catalogue number 9 25733-1. There is an additional white sticker with black text at the bottom right hand corner of the back sleeve displaying; "With Compliments of wea Records Ltd. Recommended Tracks: THE BLOOD THAT MOVES THE BODY STAY ON THESE ROADS Promotional Copy Not For Sale". The regular "Warner Bros. Records Inc." Record Company and Copyright information is also printed at the bottom left of the back sleeve but the wording "Made in U.S.A." has been omitted leaving just a gap in-between. The usual blue "WB Records" logo and text; "Also Available on Cassette and Compact Disc" is also shown. The inside of the LP comes with an inner sheet rather than an inner sleeve, although the same regular artworks and full track lyrics are shown. The actual record itself is virtually the same as the U.S. pressing apart from the colouring on the artwork is more sky blue. The publishing text; "All songs published by ATV Music Corp. BMI except as indicated ℗ 1988 Warner Bros. Records Inc. for the U.S." on the a-side has been printed in white instead of the usual blue which appears on the U.S. edition. The release also comes with the same U.S. Catalogue number 1-25733 displayed at the bottom of each side, although the matrix coding engraved around the centre rim of the record is different and displays; "HONG KONG 1-25733-A-SH3 O B- 30959-SH3 Δ 20285 1-5". The cassette has a similar cover to the US release and folds out to reveal the song lyrics. At the bottom of the front cover are the words "HANYA UNTUK DIJUAL DI INDONESIA" in white. The regular U.S. catalogue number can be seen at the bottom of the spine and on the cassette, but there is also another number "W0103-8" printed at the top of the spine. The barcode on the back sleeve is coloured black instead of the usual white and there is some Trade mark information which reads; "Trade mark and recording licensed to Aquarius Records for manufacture and sale in Indonesia only". Some copies additionally come with an official blue and white "LUNAS P P N" leafed sticker on the back sleeve. There are actual two different pressed tapes which come with the exact same folded insert, the first pressing comes with a blue tape with white printed text, and the second pressing comes instead with a clear transparent tape again with white printed text. The layout and design on both pressing is otherwise exactly the same; the title "A-HA STAY ON THESE ROADS" is shown at the top with the track listing underneath. The "WB" Logo is included on the left and the Catalogue number 9 25733-4, "STEREO" and side 1/2 is on the right. Some production and copyright information is displayed at the bottom of both sides; "℗ & © 1988 Warner Bros. Records, Inc. for the U.S. and WEA International Inc. for the world outside of the U.S. ALL RIGHTS RESERVED. UNAUTHORIZED COPYING PUBLIC PERFORMANCE BROADCASTING OF THIS RECORDING FORBIDDEN". The Israel LP is very similar to the U.S. edition including the same regular front cover artwork sleeve, with the handwritten title "a-ha stay on these roads" printed in grey. On the back sleeve, the regular open hand picture with the butterfly and handwritten text; "There’s never a forever thing" is printed down the left hand side. There is no barcode or Catalogue number displayed in the top right-hand corner. The regular full track listing is displayed in the centre of the back sleeve in blue, with the usual U.S. Warner Bros. Records contact address and copyright information printed in black and located at the bottom left hand side; "Warner Bros Records Inc., a Warner Communications Company ® 3300 Warner Blvd, Burbank, Calif. 91500. 75 Rockefeller Plaza, New York, New York 10019. © 1988 Warner Bros. Records Inc. for the U.S. and WEA International Inc. for the world outside of the U.S. ℗ 1988 Warner Bros. Records Inc. for the U.S. and WEA International Inc. for the world outside of the U.S. All Rights Reserved. Unauthorized duplication is a violation of applicable laws". However, unlike the U.S. release, the text; "Made in U.S.A" has been omitted leaving just a empty gap in-between. The regular "WB Records" logo and text; "ALSO AVAILABLE ON CASSETTE AND COMPACT DISC" is also included in blue and is displayed near the bottom of the back sleeve, along with some other additional Israel manufacturing and copyright information, printed in hebrew and displayed in bold; "מיוער ומופץ ע״י החברה הבללית למוטיקה בע״ם, החלזון 4, רמת״גן, תוצרת הארץ". The English translation is included underneath; "MANUFACTURED AND DITRIBUTED BY THE GENERAL MUSIC CO. LTD. RAMAT-GAN, ISRAEL. MADE IN ISRAEL". The record itself comes with the colour labels similar to the U.S. edition, displaying the standard artwork and including the full track listing printed in blue on one half of the a-side, and the picture of the butterfly on a hand on the other half. At the top of the a-side it additionally includes "ACUM", whilst at the bottom, it displays the Israel Catalogue number BAN 925733-1 and that the album was "Made is Israel". The regular white "WB RECORDS" and blue text; "all songs published by ATV Music Corp. BMI except as indicated ℗ 1988 Warner Bros. Records Inc. for the U.S." is also included. On the b-side of the label, it includes the colour picture of the butterfly in hand, blue "a-ha" logo and white handwritten title; "Stay on these roads". The revised Israel Catalogue number BAN 925733-1 is again shown at the bottom edge in white. The release also comes with the regular inner lyric sleeve. The Israel CD release of "Stay On These Roads" comes without any Hebrew text and includes the same CD case as the German "Manufactured Record Service GmbH, Alsdorf" second pressed album. The standard Catalogue Number 925733-2 France: WE 851 at the top right hand corner of the back sleeve is printed in the usual blue with the regular full track listing displayed down the right hand side. On the left hand side, the picture of the butterfly on an open hand is shown, along with the standard grey coloured Production and Copyright information; "Warner Bros. Records Inc., a Warner Communications Company ® © 1988 Warner Bros. Records Inc. for the U.S. and WEA International Inc. for the world outside of the U.S. ℗ 1988 Warner Bros. Records Inc. for the U.S. and WEA International Inc. for the world outside of the U.S. All Rights Reserved. Unauthorized Copying, Hiring, Lending, Public Performance And Broadcasting Of This Record Prohibited. Manufactured in Germany. Presse en Allemagne. Record Service GmbH. Alsdorf A Warner Communications Company". Along the bottom of the back sleeve is the black barcode "0 7599-25733-2 0", blue "WB" logo and "LC 0392" coding, also in blue. The album comes with the standard booklet displaying the usual artworks and full track lyrics, the Catalogue number 925733-2, like the German release is printed in white at the top right hand corner of the back page. The disc itself is silver with the usual black printed text, it appears to have been pressed by "WEA Manufacturing" and is similar to the US "WEA Manufacturing" release, displaying the same Production text on the left hand side; "℗ 1988 Warner Bros. Records Inc. for the U.S., a Warner Communications Company ® All Rights Reserved. Unauthorized duplication is a violation of applicable laws. Mfg. by WEA Manufacturing". The regular layout to the title "a-ha STAY ON THESE ROADS" is displaying at the top of the disc, with the full track listing down the right hand side. At the lower half of the centre ring is the usual "PRODUCED BY ALAN TARNEY" text, "WB RECORDS" and "COMPACT disc DIGITAL AUDIO" logos, Catalogue number 9 25733-2 and that the album was "Made in Israel". The Israel cassette is also similar to the US release and includes the fold-out insert with the regular artworks and full track lyrics. On the back sleeve, the usual barcode on the left hand side has been replaced instead with some manufacturing and distributing text which has been printed in both Hebrew and English; "החליין 4, רמתיגן, הכללית למיםיקה בע""מ, מְיוּצָר ןמןפץ ע""י החברה MANUFACTURED AND DISTRIBUTED BY THE GENERAL MUSIC CO. LTD. RAMAT-GAN, ISRAEL. MADE IN ISRAEL". On the inside of the back sleeve, the "Warner Bros. Records Inc., a Warner Communications Company ® 3300 Warner Blvd., Burbank, Calif. 91510" information is displayed without; "Made in U.S.A." being present, leaving just a gap. At the bottom of the spine, the catalogue number has also been changed to MCB 925733-4. There appears to be at least two variation of tapes, both are coloured light grey. The first edition comes with blue printed text, whilst the second edition, comes instead with black printed text. The layout and design of both editions are otherwise exactly the same. The title "A-HA STAY ON THESE ROADS" is located along the top with the full track listing to each side, including track length numbers and production text; "℗ 1988 Warner Bros. Records for the U.S." underneath. On the left hand side, it includes "STEREO" and side "1" or "2", whilst on the right hand side, it shows the Catalogue number MCB 925733-4 and "ACUM". Along the bottom of both sides is some additional copyright information; "All rights of the producer and of the owner of the work reproduced reserved. Unauthorized copying, hiring, lending, public performance and broadcasting this cassette prohibited". strip but has the price in yen printed at the bottom of the spine on a yellow background. There was another reissue (WPCR-357) from 25 May 1995, it omes with a white obi with a yellow spine and black text. There is a red bomb on the front and spine with "HOT PRICE 1800" in yellow. It comes with a white CD tray instead of the usual grey. All three have the same insert booklet plus white folded paper lyric and info sheet with black and white shot of the band (Morten, Paul, Mags). The discs are gold with black text, red WB logo plus red trim around the edge. Early pressings of the LP, CD and cassette come with a limited edition Norwegian flag "Official Fan" cloth sticker and picture lyric sheet. This includes the promo edition of the first release (32XD-983). This edition has a white sticker with red Japanese promo text over the bar code on the back sleeve plus Japanese promo text etched in black in the centre of the disc. There also exists a "24K" gold CD edition which has a black obi strip with gold spine. The text is printed in gold, black and white letters. The disc is gold with black text, red logo and red trim around the edge (similar to the discs of the Japanese club CD releases). The CD tray is also gold/ brown in colour. The regular Japanese cassette release comes in a white backed cassette case with a long wrap-around sleeve. 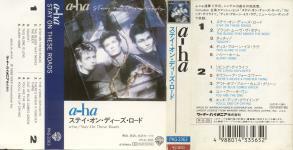 The front and back sleeve is in white with the regular LP artworks displayed at the top of the front cover, the a-ha logo is shown in light blue with the titles in black, both printed in English and Japanese. The Catalogue number PKG-3363, "STEREO", "WB RECORDS" and "DOLBY SYSTEM" logos are also included. On the back cover, the full track listing is shown along with "MADE IN JAPAN" and "(P) 1988 WEA International Inc". The left spine is coloured navy with the a-ha logo displayed again in light blue, the title "STAY ON THESE ROADS", "WB RECORDS" logo and catalogue number are shown in white. There is a small shot of the cover artwork on the right hand spine, the title has now been displayed in Japanese and again printed in light blue, it also includes a black a-ha logo. At the bottom of the spine, the catalogue number is printed in white on a blue background and there is a white price tag of ¥2,800 which is printed instead on a red background. The right hand fold out insert comes with some Japanese text at the top and includes the full track listing underneath in both English and Japanese. There is also some manufacturing information; "MADE BY WARNER PIONEER CORPORATION, JAPAN, UNDER LICENSE FROM WARNER BROS. RECORDS (JAPAN) INC., U.S.A.". Along the bottom, there is a large white barcode which comes with a different number "4 988014 335652" compared to the European release. The inside of the folded insert advertises the four earlier Japanese A-ha album releases; along with the full track listing and track credits. There is also some "DOLBY SYSTEM" and copyright information displayed at the bottom in both English and Japanese. 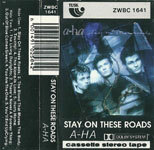 The actual tape is white with black stickered labels and white text; it displays the title at the top "STAY ON THESE ROADS/a-ha" with the track listing to each side underneath. The same manufacturing information which appeared on the folded insert is included at the bottom. Additionally included inside is the limited edition Norwegian flag "Official Fan" cloth sticker and there is also a grey paper folded sheet with black text, it contains all of the full track lyrics both in English on one side and Japanese on the other. There is a promo cassette in Japan which comes with a white backed cassette case and displays a similar front cover artworks taken from the "Stay on these Roads" single rather than the regular album release, it includes the catalogue number and text; "PSC-163/SAMPLE/NOT FOR SALE/STEREO" along the bottom in white, the "DOLBY SYSTEM" and "WB Records" logos are also printed in black on the front cover. The spine and back sleeve is brown with white text; the full track listing is displayed on the back sleeve along with side numbers 1/2 and "WARNER-PIONEER CORPORATION". The spine shows the title in Japanese and includes the a-ha, "WB Records" logo and catalogue number. The insert folds out single fold to show the title at the top and includes the full track listing with track credits and track lengths alongside. There is also some Japanese text displayed at the bottom. 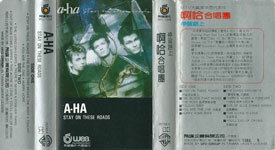 Like the regular Japanese cassette release of the album, the cassette is white with black stickered labels and white text, although the layout and design slightly differs, the title "STAY ON THESE ROADS/a-ha" is shown at the top with the track listing to each side underneath. The "Warner-Pioneer" logo is displayed on the left hand side on a white squared background, the "JASPAC", "STEREO" and "DOLBY SYSTEM" logos are also included. The catalogue number and SIDE A/B is shown on the right hand side. Along the bottom it has "WARNER-PIONEER CORPORATION" displayed in both English and Japanese. The obi strip of the LP features part of the album cover picture, so that when the obi is in place, none of the cover picture is 'missing'. The a-ha logo is printed in large blue letters down the obi with the titles in white and grey. The "Oasis Records Company Co." manufactured the Korean LP of "Stay On These Roads under license from WEA Int’l". 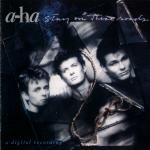 The release is like the U.S. edition showing the regular album artworks displaying the picture of a-ha with the broken glass and string but coming slightly darker in colour. The usual handwritten title "a-ha stay on these roads" is printed along the top in grey. On the back sleeve, there is no barcode included in the top right-hand corner, but instead displays the Korean Catalogue number OLW-539 with the U.S. number (25733-1) printed alongside in brackets. The regular full track listing is printed as usual in the centre of the sleeve, with "side one" and "side two" displayed above in light blue, and the tracks themselves shown in dark blue. The usual open hand picture with the butterfly and handwritten text; "There’s never a forever thing" is printed down the left-hand side. Located at the bottom left of the back sleeve is the regular blue "WB RECORDS" logo and grey printed "Warner Bros." record company address and copyright information; "Warner Bros Records Inc., a Warner Communications Company ® 3300 Warner Blvd, Burbank, Calif. 91500. 75 Rockefeller Plaza, New York, New York 10019. © 1988 Warner Bros. Records Inc. for the U.S. and WEA International Inc. for the world outside of the U.S. ℗ 1988 Warner Bros. Records Inc. for the U.S. and WEA International Inc. for the world outside of the U.S. All Rights Reserved. Unauthorized duplication is a violation of applicable laws" but omitting the text "Made in U.S.A", leaving just an empty space in-between. Along the bottom of the back sleeve has some additional Korean manufacturing information; "Manufactured by Oasis Record Co. under license from WEA Int’l. Approved by the K.E.C.P.P. Ministry of Culture and Information Registration No. 16". It also includes that the LP was "Printed in Korea". There is an additional three-section strip box included at the bottom right-hand corner which displays some tiny Korean text in the first, the "OASIS RECORDS" and "wea" logos in the second, and that the album was "MANUFACTURED BY OASIS RECORDS CO." in the third. The inside of the LP comes with a black and white printed lyric sheet, which is slightly smaller than the regular inner sleeve which is generally used on other releases of the same album. Located on one side of the lyric sheet is a picture of the a-ha band members all holding guitars, with the album title; "stay on these roads a-ha" and some other Korean black text printed above in a grey shaded area. The full track listing to the album has been included in both English and Korean and is displayed below the a-ha picture. There is also some additional Korean information regarding the history of a-ha and referring to the earlier formed band "The Bridges" (which has been printed on the lyric sheet as the Britches). Several of a-ha’s hit singles are also included in the write up including; "Take On Me", "The Living Daylights", "I’ve Been Losing You" and "The Blood That Moves The Body". The three first albums "Hunting High And Low", "Scoundrel Days" and "Stay On These Roads" are also referred to in the text. On the reverse of the lyric sheet is all the song words to each track printed in English. The record itself comes with the regular coloured labels, containing the usual album artwork layout. The a-side is white, with the track listing to both sides printed instead in a darker blue on one half of the label, and the picture of a butterfly on an open hand with a white "WB-logo" on the other half. The Korean Catalogue number OLW 539 is also displayed in the darker blue and is included on the middle right-hand side, along with some other additional coding; "8805-L 2894 - L 2898" and the Korean production reference dates; "℗ Jun.4.1988 88-534(88.6.27)". The U.S Catalogue number 1-25733 is printed in dark blue along the bottom. On the b-side, the regular larger picture of the butterfly in hand is shown along with the handwritten title; "stay on these roads" in white. The a-ha logo is also present but has been printed in the light blue, rather than the usual dark blue. The Catalogue number has not been included at the bottom the b-side. The record is housed in a clear transparent polythene sleeve advertising several record company logos on one side, these comprising of the "wea" logo along the top, "WB RECORDS", "ELEKTRA", "ATLANTIC" and "BUDDAR" on the left, "MCA", "REPRISE", "ATCO" and "ISLAND" on the right, plus the "OASIS RECORDS" logo along the bottom. The promotional copy of the LP has some additional Korean text printed in grey at the bottom left-hand corner of the sleeve. There is also an LP which has a purple toned sleeve. This LP is thought to be unofficial. The Korean CD release comes with a similar front and back cover to the German first pressing; it also includes the same colour booklet but comes with a different catalogue number printed in white on the back page. The back sleeve comes without a barcode and displays some additionally Korean manufacturing and distributing information printed in bold; "Manufactured and Distributed By SKC Limited, Korea Ministry of Culture and Information No. 86/ 8805-L2894~2903". The "SKC" and "WB Records" logos are also shown. 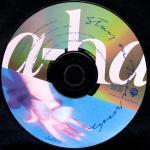 The disc is silver with black text and is again similar to the regular release displaying the title "a-ha STAY ON THESE ROADS" at the top, with the full track listing printed down the right hand side. On the left hand side, there is some Production and Manufacturing information; "(P) 1988 Warner Bros. Records Inc. for the U.S. a Warner Communications Company ® Manufactured by SKC Limited, Korea". At the lower centre of the disc, it displays the usual text; "PRODUCED BY ALAN TARNEY", "WB Records" and "COMPACT disc DIGITAL AUDIO" logos. The Korean catalogue number 25733-2 (SW-F-0116) is also present along with a dated coded reference; 88-534 (88. 6. 27)/89. 6. 30. The Korean cassette release of "Stay On These Roads" comes in a slipcase. It has a silver grey sleeve with a picture of the regular album sleeve in the centre, above the picture, "Golden Hits" is printed on a red background and "Stay On These Roads The Living Daylights" is printed along a blue strip. "A-HA" and the title are printed in dark red and black respectively. At the bottom of the front cover, the "DOLBY SYSTEM" and "WB Records" logos are additional shown. On one of the spines, it displays "A-ha" and the title "STAY ON THESE ROADS" in the same dark red and black, there is a small picture of Magne at the top with "STEREO" above printed in yellow, The catalogue number OWT-539 is also displayed at the top in black and the "wea" and "DOLBY SYSTEM" logos at the bottom. The other spine comes instead with A-HA and the title printed in Korean, there is a now a small picture of Morten displayed again with "STEREO" printed in yellow above. The catalogue number is again shown at the top in black with the "DOLBY SYSTEM" and "OASIS RECORDS" logos at the bottom. The back of the slipcase shows the track listing in both English and Korean, the same blue strip with "Stay On these Roads The Living Daylights" printed in yellow is again displayed at the top. Along the bottom, there is some Manufacturing information which reads; "Manufactured by Oasis Record Co. under license from WEA Int’l Approved by K.E.C.P.P. Ministry of Culture and Information Registration No. 16 Printed in Korea". The tape is white with a red, white and black stickered label. The Malaysian cassette release comes with the same folded insert as the US Warner Brothers release, but comes with a blue and white "Warner Music" sticker on the front cover. The back of the cassette case is coloured light grey. At the bottom of the back sleeve under the track listing, there is some additional Malaysian Record Company and Printing information which reads; "EDARAN: WEA RECORDS SDN. BHD., NO. 17 JALAN 1/57A, BATU 3 JALAN IPOH, 51200 KUALA LUMPUR. DICETAK OLEH: DIGITPRESS SDN. BHD.". Unlike the US pressing, there is No Barcode or "Dolby" information included on this Malaysian release. On the inside of the back sleeve, it displays the usual "Warner Bros. Records Inc." Record Company information but omits the "Made in U.S.A." part and just leaves a gap. The actual tape is also light grey with a light blue stickered label and black printed text. 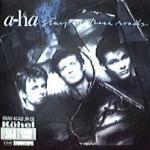 The title "A-HA • STAY ON THESE ROADS" with the track listing underneath is shown at the top. On the left hand side, it displays the "WB Records" logo and Catalogue number 25733-4, with Side 1/2 being on the right hand side. Along the bottom of side 1, there is some production information to "Alan Tarney" along with some Copyright information which reads; "All rights reserved. Unauthorized copying public performance broadcasting of this recording forbidden". At the bottom of side 2, there is instead some Record Company information; "(P) 1988 Warner Bros. Records Inc. for the U.S. & Wea International Inc. for the world outside of the U.S.". At the bottom right hand corner of each side of the tape and on the back of the cassette case, it has the "Warner music" logo engraved into the plastic. Some copies come with an additional "WEA" white rectangular sticker on the back of the cassette case giving information on "how to check that the copy is genuine"; it displays both the information in English and Malaysian. The "WEA Record Company" contact address is also displayed "WEA RECORDS SDN BHD 9th Floor, MUI Plaza Jalan P, Ramlee 50250 Kuala Lumpur, Malaysia". The LP has a similar front cover to the U.S. release but additionally includes the catalogue number LWB-6721 in the top right hand corner. The reverse of the sleeve has the tracks printed in both English and Spanish. The English text is shown in the usual blue with the Spanish being in black uppercase lettering. The catalogue number is again additionally shown at the top right hand corner. The regular artwork picture displaying the open hand with the butterfly and handwritten text; "There’s never a forever thing" is as usual displayed down the left hand side. At the bottom left hand corner, there is some manufacturing and copyright information printed in black and all shown in Spanish, it reads; "HECHO EN MEXICO PARA SU VENTA EN MEXICO EXCLUSIVAMENTE. MAY IMPORTANTE Este fonograma es una obra intellectual protegida en favour de su productor ℗© 1988 WARNER BROS. RECORDS INC. La titularidad del derecho contenido en el fonograma se encuentra reconocido en el Registro Publico del Derecho de Autor. Direccion General del Derecho de Autor Secretaria de Educacion Publica. Se Prohibe su copia o reproduccion parcial o total, la violacion de esta prohibicion esta penada conforme a los articulos 386 del Codigo Penal 135 y 136 de La Ley Federal sobre el Derecho de Autor Vigente. HECHO EN MEXICO POR PRODUCCIONES WEA, S.A. DE C.V. ACAPULCO 37 MEXICO 06140, D.F. UNA CIA DEL GRUPO WARNER COMMUNICATIONS / MARCAS REGISTRADAS". There is also a blue "WB Records" logo and a black "wea" logo included. The record comes with the regular artwork label but with some slight differences. On the a-side, the label is again white with the track listing shown for both sides in blue on half and the picture of the open hand with the butterfly on the other. The catalogue number LWB-6721 is displayed in black in-between the track listing. On the picture, there is no usual white "WB Records" logo, plus the text; "All songs published by ATV Music Corp. BMI except as indicated ℗ 1988 Warner Bros. Records Inc. for the U.S." has been omitted. There is instead some additional Spanish manufacturing information displayed around the outer edge of the label on each side in black text; "HECHO EN MEXICO. D.F., POR PRODUCCIONES WEA, S.A. DE C. V. UNA COMPANIA DEL GROUPO WARNER COMMUNICATION". The b-side of the label just includes the regular picture of the butterfly in the open hand, blue "a-ha" and the title "Stay on these roads" in white. The LP doesn’t include an inner lyric sleeve. The Mexican cassette release comes with the regular front cover artworks but the spine and back cover is coloured blue with white text, the track listing on the back cover is displayed all in Spanish; "LADO UNO • QUEDATE EN ESTOS CAMINOS • LA SANGRE MUEVE EL CUERPO • SENSIBLE • ESTE SOLITARIO ES AMOR • APURATE A LLEGAR A CASA • LADO DOS • LOS DIAS LUMINOSOS • NO HAY NADA ETERNO • DE REPENTE VIENE EL VERDE • TU ERES LA UNICA • TERMINARAS LLORANDO". There is also some manufacturing text; "HECHO EN MEXICO POR PRODUCCIONES WEA, S.A. DE C.V. UNA CIA. DEL GRUPO WARNER COMMUNICATIONS" and Copyright information; "© 1988 WARNER BROS. RECORDS INC". At the bottom left hand corner it displays the word trademark in Spanish "MARCAS REGISTRADAS" and at the bottom right "PARA SU VENTA EN MEXICO" which translates to; "For Sale in Mexico". The spine displays the title on the left "A-HA" with "STAY ON THESE ROADS" underneath. The "DOLBY SYSTEM", "wea" and "WB Records" logos are shown on the right, along with the catalogue number CSWB-6721. The inside of the insert is white with black text, the full track listing is shown in Spanish, with the English translation displayed alongside, there is also some track credits and "ATV Music Corp." production text, the inside of the spine includes some further Manufacturing and Record Company information; "Hecho en Mexico por PRODUCCIONES WEA S.A. De C.V., Acapulco 37 Mexico 06140 Tel. 553-6688 una compania del grupo WARNER COMMUNICATIONS ® MARCA REGISTRADA". There is also some strict Spanish Copyright information displayed on the inside of the back cover which reads;- "MUY IMPORTANTE: Este fonograma es una obra intelectual protegida en favor de su productor. Derechos reservados. La titularidad de los derechos contenidos en el fonograma se encuentra reconocida y protegida CONFORME A LA LEY SE PROHIBE SU COPIA O REPRODUCCION PARCIAL O TOTAL, SU ALQUILER Y SU EJECUCION PUBLICA Estas prohibiciones estan penadas conforme a los Articulos 386 del Codigo Penal y 135 y 136 de la Ley Federal sobre el Derecho de Autor y demas normas legales aplicables vigentes". The catalogue number CSWB-6721 and "wea" logo are additionally shown at the bottom. There appears to be at least two different pressings, the first release includes a white coloured tape with black printed text, the title "A-HA / STAY ON THESE ROADS" is shown at the top with the track listing underneath in Spanish. At the bottom of side 1, there is some Production and Manufacturing information; "(P) 1988 Warner Bros. Records Inc. UNA COMPANIA DEL GRUPO WARNER COMMUNICATIONS HECHO EN MEXICO" and along the bottom of side 2, there is instead some Copyright Information; "(C) 1988 Warner Bros. Records Inc. EL IMPORTE PAGADO POR ESTE FONOGRAMA NO AUTORIZA SU EJECUCION PUBLICA CON FINES DE LUCRO". The "WB Records" logo is displayed on the left of each side with the catalogue number CSWB 6721 on the right hand side. The second release comes instead with a black tape with a blue stickered label and blue printed text. The layout and font size of the text is otherwise identical to the first release including the large WB Records logo on the left hand side, the Production and Manufacturing has again been printed along the bottom of side 1, with the Copyright Information shown instead along the bottom of side 2. The Peru LP of "Stay On These Roads" comes with a regular colour front and back cover artwork sleeve, but on the reverse, most of the text is instead printed in black, rather than blue, including the full track listing in the centre of the sleeve. There is no barcode included on the back sleeve, but instead located in the top right hand corner is the Catalogue numbers for both the Peruvian LP; "PN-WBR-0257331.4" and that the album was also available on Cassette; "(Tambien disponible en cassette: CN-WBR 0257334.4)". The word "STEREO" is additionally shown. There is a large black "WB RECORDS" logo displayed at the bottom centre of the sleeve, along with some additional Spanish Manufacturing information again printed in black text which reads "FABRICADO POR "EL VIRREY" INDUSTRIAS MUSICALES S.A. EL DISCO ES CULTURA". At the bottom right hand corner, there is also some anti-piracy information which includes an image of cassette tape with crossbones and some Spanish text;- "PIRATERIA FONOGRAFICA LA COPIA DE ESTE FONOGRAMA CONSTITUYE DELITO DE ESTAFA, PENADO CON PRISION DE HASTA 6 ANOS (LEY No 23535)". The record has white labels with printed lines and includes the regular large colour "WB RECORDS" logo at the top of each side with the title "STAY ON THESE ROADS A-HA" underneath. All of the song titles are printed in Spanish and English, along with credits and track lengths. On the left hand side, the Catalogue number; "PN–WBR 0257331.4" and "ST 33" is shown, whilst on the right, side "1" or "2", "STEREO" and "℗ 1988" are displayed. At the bottom of side 1 under the track listing, there is some additional publishing text; "ALL SONGS PUBLISHED BY ATV MUSIC CORP. BMI" shown. At the bottom of side 2, the information has been slightly revised to read; "ATV MUSIC CORP/UNITED LION MUSIC, INC. BMI ALL SONGS PUBLISHED BY ATV MUSIC CORP. BMI EXCEPT AS INDICATED". Around the outer rim of the label is some Manufacturing information which is similar to that shown on the back sleeve; "MANUFACTURADO POR "EL VIRREY" INDUSTRIAS MUSICALES S.A. INDUSTRIA PERUANA REG. IND. 12428", plus there is also some additional Spanish Copyright information;- "RESERVADOS TODOS LOS DERECHOS DEL PRODUCTOR FONOGRAFICO Y DEL PROPIETARIO DE LA OBRA REGISTRADA - PROHIBIDA LA REPRODUCCION EJECUCION PUBLICA Y RADIO TELEDIFUSION DE ESTE DISCO". The release does not include an inner sleeve. The Peruvian cassette release comes with a light blue front cover displaying the usual LP artworks in the centre. The title "STAY ON THESE ROADS A-HA" is displayed at the top, along with the catalogue number CN-WBR 0257334.4, "STEREO" and the "WB Records" logo shown in black. There is some Spanish manufacturing information "FABRICADO POR "EL VIRREY" INDUSTRIAS USICALES S.A. R.I. 12428" printed in white at the bottom. The spine and back sleeve is white with black text and doesn’t fold out to include any track lyrics. The track listing is printed in Spanish on the back sleeve along with some piracy information which includes an image of a cassette tape with crossbones; "PIRATERIA FONOGRAFICA LA COPIA DE ESTE FONOGRAMA CONSTITUVE DELITO DE ESTAFA, PENADO CON PRISION DE HASTA 6 ANOS (LEY NO 23535)". The actual tape is clear with a grey label and black text. The title is displayed in capitals at the top and the manufacturing information printed in Spanish shown at the bottom; "QUEDAN RESERVADOS TODOS LOS DERECHOS DEL AUTOR Y DEL PRODUCTOR DE FONOGRAMAS ESTA PROHIBIDA LA COPIA, LOCACION Y EJECUCION PUBLICA DE ESTE FONOGRAMA. MANUFACTURADO POR "EL VIRREY" INDUSTRIAS MUSICALES S.A. - INDUSTRIA PERUANA - R.I. 12428". The LP has a slightly discoloured front cover and has PARI-MEMBER approved signs on the labels and back cover. It doesn't come with inserts. The Philippine cassette release comes with a black front and back sleeve showing the LP artworks at the top, the track listing is printed in yellow in the centre with Side 1 & 2 being in white. Along the bottom of the front cover, it includes the "PARI MEMBER APPROVED" symbol, catalogue number 25733-4, "DOLBY SYSTEM" and "WB RECORDS" logos. The back cover also displays the track listing and sides 1/2 in the same yellow and white, along with a large white "WB RECORDS" logo. There is also some manufacturing information printed at the bottom of the back cover which reads; "MANUFACTURED IN THE PHILIPPINES FOR WEA RECORDS UNDER LICENSE FROM WEA INTERNATIONAL INC. U.S.A. A WARNER COMMUNICATIONS COMPANY". On the spine, the "A-HA" logo is coloured yellow with the title "STAY ON THESE ROADS" printed in white, the "WB RECORDS" and "DOLBY SYSTEM" logos, along with the catalogue number and "STEREO" are also shown in white. The right hand side of the folded insert displays the title and full track listing in the usual yellow and white at the top, with the track lengths included alongside. There is some Production text printed in white at the bottom; "Produced by Alan Turney. All songs published by ATV Music Corp. BMI except as indicated. (P) 1988 Warner Bros. Records Inc. of the U.S.". (The spelling of Alan Tarney has been shown incorrectly). Also included on the inside of the back cover is some "DOLBY B" text and Copyright information. The large "WB RECORDS" logo is again included. On the inside of the folded insert, it includes an eight paged mini booklet displaying all the track lyrics printed in black. There at least two slightly different pressings of the cassette which come with the same folded insert; the first pressing comes with a black tape with a black stickered label with white text, the track listing and "DOLBY SYSYEM" logo is shown at the top and the title "A-HA STAY ON THESE ROADS" at the bottom, the "PARI-MEMBER APPROVED" symbol is displayed on the left and catalogue number, "WB Records" and "STEREO" on the right. The second pressed tape comes instead with a cream coloured tape, with a light green stickered label and black text. The layout and design is otherwise exactly the same as the first pressed cassette. "Stay on these Roads" was released on LP in Portugal and comes with the same front cover as the UK/German edition with the regular album artworks. The back sleeve is white and includes the usual track listing in the centre but comes with the additional text; "Also Available on Cassette and Compact Disc" in blue underneath. The regular open hand picture with the butterfly and handwritten text; "There’s never a forever thing" is displayed down the left hand side. At the bottom left hand corner, the usual U.S. Record Company contact address and Copyright information is printed in black text and reads; "Warner Bros Records Inc., a Warner Communications Company ® 3300 Warner Blvd, Burbank, Calif. 91500. 75 Rockefeller Plaza, New York, New York 10019. © 1988 Warner Bros. Records Inc. for the U.S. and WEA International Inc. for the world outside of the U.S. ℗ 1988 Warner Bros. Records Inc. for the U.S. and WEA International Inc. for the world outside of the U.S. All Rights Reserved. Unauthorized duplication is a violation of applicable laws". Unlike the U.S. release, the text; "Made in U.S.A" has been omitted and just leaves a gap in-between. The blue "WB Records" logo is also additionally included. At the top right hand corner, the regular white barcode is shown with the Portugal Catalogue number 1592741, circled "FB" symbol and "STEREO" logo. There is also a small white rectangular sticker with blue text displaying "WHV". There is some manufacturing and distributing information displayed at the lower right of the back sleeve showing; "MANUFACTURED & DISTRIBUTED IN PORTUGAL BY EMI VALENTIM DE CARVALHO MUSIC LDA", plus at the very bottom right, it shows a "G)))" symbol with the text; "execucao Grafica Monumental" which refers to where the LP was Printed. The record label itself comes with just a standard plain white label on each side (rather than butterfly/hand pictured one) with black text. It displays the colour "WB Records" logo at the top, with the title "A-HA STAY ON THESE ROADS" underneath. The full track listing to each side is displayed at the lower half of the label with the text; "A Warner Communications Company" and logo. On the left hand side, "STEREO" and Catalogue number "1592741 A/B" is shown with "S P A" and again the Catalogue number 1592741 on the right hand side. Around the outer rim of the labels (on both sides), is some manufacturing, distributing and copyright information all displayed in Spanish, it reads; "RESERVADOS TODOS OS DIREITOS DO PRODUCTOR FONOGRAFICO E DO PROPRIETARIO DA OBRA GRAVADA PROIBIDOS A DUPLICACAO O ALUGUER E A UTILIZACAO DESTE DISCO PARA EXECUCAO PUBLICA E RADIODIFUSAO NAO AUTORIZADOS FABRICADO E DISTRIBUIDO EM PORTUGAL POR EMI-VALENTIM DE CARVALHO, MUSICA LDA". The LP also comes additionally with an inner lyric sleeve, but the text and artworks are instead printed and displayed in black rather than the usual blue. "Stay On These Roads" was re-issued in a card slipcase in 2003, click here for more details. "Stay On These Roads" was re-issued by Никитин in Russia. There are at least two different versions, one copy has a front cover similar to the European release displaying the picture of a-ha with broken glass and some string, the other edition comes with just a plain blue front sleeve with the title printed in grey at the top, and without any album artworks. The back sleeve on both editions is exactly the same and is similar to the German and European releases, the regular artwork picture of the open hand with the butterfly, plus the full track listing in blue is included down the right hand side. There is also some additional Russian "НИКИТИН" Record Company contact details, plus "Do not expose to mechanical or magnetic influences. Avoid direct sunlight and moisture" information displayed in black; "Warner Bros. Records Inc., A Warner Music Group Company. 3300 Warner Blvd., Burbank, CA 91505-4694; 75 Rockefeller Plaza, New York, NY 10079-6908. © & ℗ 2005 Warner Bros. Records Inc. for the U.S. and WEA International Inc. for the world outside the U.S. Произведено в России. Издатель: ООО «Оирма грамзаписи «Никитин» по зксклюзивной лицензии «Warner Music» ВСЕ ПРАВА ЗАЩИЩЕНЫ. Адрес для направления предложений и претензий: «Фирма грамзаписи «Никитин», 105082, г.Москва, ул.М.Почтовая д.12, стр.1, тел. : (495) 232-13-87, e-mail: [email protected], www.fgnikitin.ru Эксклюзивный дистрибьютор. «Торговая фирма «Никитин»: тел. : (495) 265-49-07, 265-49-18; e-mail: [email protected], www.tfnretail.ru Изготовитель (см. информацию на внутреннем кольце компакт-диска вокруг установочного отверстия): ООО «Уральский электронный завод», 620137, г.Екатеринбург, ул.Студенческая, д.9, корп. 11а. Лицензия ВАФ 77-15 от 21.09.07 г. ООО «Линос» 117587, г.Москва Варшавское шоссе, д.125ж стр 1. Лицензия ВАФ № 77-238 от 03.02.2006г. Музыкальный копакт-диск формата CD-DA. гост 27667-88, гост 28376-89, гост Р 51121-97. Содержит му3ыкальную запись. Не подлежит обязательной сертификации. Не подвергать механическому или магнитному воздействию. Избегать попадания прямых солнечных лучей и влаги". Along the bottom, the "WB" and "ФИРМА ГРАМЗАПИСИ НИКИТИН" logos are displayed, along with a smaller barcode "4607173 157010" compared to the European release. Both albums also include a slim obi-strip which features an edge slice of the regular album artwork, displaying a "WARNER MUSIC" logo at the top and some Russian white printed text below; "«a-ha - ЭТО ГРУППА, СТАВШАЯ ИДОЛОМ ДЛЯ ВСЕЙ МОЛОДЕЖИ 80-Х» (ROLLING STONE) ЭТОТ АЛЬБОМ БЫЛ ПРОДАН ТИРАЖОМ БОЛЕЕ 4 OOO OOO ЭКЗЕМПЛЯРОВ ПО ВСЕМУ МИРУ И ЗАВАОЕВАЛ МУЛЬТИПЛАТИНОВЫЙ СТАТУС. ИЗДАНИЕ ВКЛЮЧАЕТ СУПЕРХИТЫ THE LIVING DAYLIGHTS И STAY ON THESE ROADS". when translated, it reads; "a-ha - THIS GROUP, WHICH WAS AN IDOL FOR THE WHOLE YOUTH OF THE 80's (ROLLING STONE) THIS ALBUM SOLD 4,000,000 COPIES WORLDWIDE AND HAS MULTIPLATINUM STATUS. THE EDITION INCLUDES THE SUPERHYTHE OF «THE LIVING DAYLIGHTS» AND «STAY ON THESE ROADS»". At the bottom of the front obi, it contains the image of the Russian Flag with the text; "FOR SALE IN RUSSIA", it also displays the "ФИРМА ГРАМЗАПИСИ НИКИТИН" logo. The spine and reverse of the obi are white, the title "a-ha STAY ON THESE ROADS" has been displayed landscaped and printed in blue on the spine, with the "ФИРМА ГРАМЗАПИСИ НИКИТИН" logo again shown in blue and displayed on the left hand side, the Catalogue number 4607178157010 is in black and to the right. On the reverse of the obi at the top, there is some Russian black "Также в продаже:" (Also on sale:) text, plus two small cover shots of "HOW CAN I SLEEP WITH YOUR VOICE IN MY HEAD 4607173154187" and "LIFELINES 4607173154330", whilst at the bottom, there is a black barcode "4607173 157010" and the "www.fgnikitin.ru" website address. The European front covered edition comes additionally with the "ФИРМА ГРАМЗАПИСИ НИКИТИН" logo in the shape of a shield on the back of the obi, but the plain blue edition comes without, it instead includes a "WARNER MUSIC INTERNATIONAL FOR SALE IN RUSSIA" Silver Hologram sticker at the bottom right of the front cover. The inside of both editions include a double sided insert rather than the usual lyric booklet, only artworks taken from pages 9 and 11 from the European booklet, plus some credits are used. The back cover of the double sided insert is also coloured a darker blue and displays the full track listing in black. On the left hand side, the usual white handwritten text; "There's never a forever thing" has been replaced by "stay on these roads". There is no Catalogue number included on the back cover. The disc included on both editions is the same, gold with black printed text, the layout is similar to the European release, but the font size of the text is slightly different. The title "a-ha STAY ON THESE ROADS" is displayed along the top, with the usual track listing down the right hand side and regular Production text; "℗ 1988 Warner Bros. Records Inc. for the U.S., a Warner Communications Company" on the left. At the lower half of the disc, the "PRODUCED BY ALAN TARNEY" text is shown, along with the "ФИРМА ГРАМЗАПИСИ НИКИТИН", "WARNER MUSIC", "WB RECORDS", "GEMA/BIEM" and "COMPACT disc DIGITAL AUDIO" logos. The Catalogue number 4607173157010 is also included. Around the outer edge of the disc is some Russian Record Company text, similar to that printed on the back sleeve; Издатель: ООО «Оирма грамзаписи «Никитин» по зксклюзивной лицензии «Warner Music» ВСЕ ПРАВА ЗАЩИЩЕНЫ and some regular English Copyright Information. There is also a cassette album of "Stay On These Roads" which was re-issued by "Никитин" in Russia, it is similar to the European edition, but comes with a different layout to the front and back cover artworks. The front sleeve shows a slightly larger cropped picture of a-ha with the broken glass and string, the title "a-ha stay on these roads", like the CD release, has been printed along the top of the front sleeve, and are both printed this time in white, rather than a-ha being in the usual grey. On the spine, the layout and design differs somewhat compared to the regular release, showing just a plain white background with blue printed text. The title "a-ha STAY ON THESE ROADS" is displayed landscaped in the centre, with the Catalogue number 7599-25733-4 HH-185MC/03 shown orientated at the top and the "WB" logo, plus "WWW.records.ru" website at the bottom. The back sleeve is also coloured white and displays the full track listing in black down the left hand and centre of the sleeve, "Side A" and "Side B" are shown instead in blue above. A black barcode "0 75992 57334 4" is also included on the right hand side. Along the bottom, there is some Production and Copyright information which is printed in both English and Russian; "℗ & © 1988 WARNER BROS. RECORDS INC. FOR THE U.S. AND WEA INTERNATIONAL INC. FOR THE WORLD OUTSIDE OF THE U.S. ALL RIGHTS RESERVED. ℗ 2003 ФИРМА ГРАМЗАПИСИ НИКИТИН / WWW.RECORDS BСЕ ПРАВА ЗАЩИЩЕНЫ EMAIL: [email protected] ТЕЛ./Ф. : (095) 781-27-63. ГОСТ 23963-86, ГОСТ 20492-87, ТУ-43-03-30-89. ДИСТРИБУЦИЯ АУДИОКАССЕТ - «ТОРГОВАЯ ФИРМА НИКИТИН»: ТЕЛ:(095) 381-48-80, 381-66-05. АДРЕС ДЛЯ НАПРАВЛЕНИЯ ПРЕДЛОЖЕНИЙ И ПРЕТЕНЗИЙ: 117545, Г.МОСКВА УЛ. 1–Й ДОРОЖНЫЙ ПР–Д, Д. 9/10, СТР. 1, ТЕЛ: (095) 381-48-80, 381-66-05. E-MAIL: [email protected]". The reverse of the sleeve comes with the full track listing printed in black and includes the track lengths, some production and album credits taken from page 9 of the regular CD booklet are also displayed, as is the black and white picture of a-ha. On the reverse of the spine, it has the regular blue strip with the white handwritten text; "There's never a forever thing", whilst on the inner back sleeve, there is some further Russian text; "Музыкальная кассета формата МС. Содержит музыкальную запись. Не подлежит обязательной сертификации. Не подвергать механическому или магнитному воздействию. Избегать попадания прямых солнечных лучей и влаги." which translates to; "Musical cassette format MS. Contains a music recording. Not subject to mandatory certification. Do not expose to mechanical or magnetic influences. Avoid direct sunlight and moisture". The tape is transparent clear with red and white cogs and white printed text. 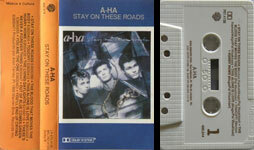 The title "a-ha STAY ON THESE ROADS" is displayed along the top in the same format as that shown on the spine, with the track listing to each side included underneath. At the top left hand corner we again have the "www.records.ru" website logo with "ФИРМА ГРАМЗАПИСИ НИКИТИН" at the top right. The Catalogue number and "WB" logo are displayed on the left hand side. Along the bottom of side A, there is some Russian "НИКИТИН" Manufacturing and Record Company contact details; "Изготовитель ЗАО "СБС-рекордз". Лицеизия МПТР России ВАФ № 77-7 Адрес: 107150,а. Москва,ул. Пермская б. 11, елаб. 1. Ту 2374-003-07623106-97". On side B at the bottom, it displays instead; "℗ & © 1986 WARNER BROS. RECORDS INC. AND WEA INTERNATIONAL INC. ℗ 2003 Фирма грамэаписи "НИКИТИН"/ www.records Торговая фирма "НИКИТИН" (095) 381-48-80, 381-66-05". Also included at the bottom of each side of the tape are the "DIGITAL MASTER" and "DOLBY HX PRO" logos. The front cover of the cassette is white with a-ha in red and the title "stay on these roads" in green along the top, the regular LP album cover artwork is displayed in the centre, the artwork picture additionally includes some Gold Lettering "THOMSUN ORIGINAL" printed across it. At the bottom left hand corner, there is also a pink "THOMSUN ORIGINAL" logo. The "DOLBY SYSTEM" logo and "STEREO" are additionally shown in black at the bottom right. The spine and back sleeve is light blue with pink and black text, the "THOMSUN ORIGINAL" logo is again displayed landscape on the left hand side of the spine, with the pink title "a-ha stay on these roads" in the centre and catalogue number EN-2321 on the right. The full track listing is shown in black on the back sleeve, it is similar to the European release but listed in a slightly different order with "There's Never A Foreever Thing" coming after "This Alone Is Love". "Hurry Home" is also listed with a spelling mistake as "Burry Home". This release is therefore not thought to be official. The tape itself is black with a black, white and green stickered label; the track listing is displayed along the top in black text, with Side "A/B" and the Catalogue number EN-2321 included, "STEREO", "THOMSUN ELECTRONICS" and "DOLBY SYSTEM" logos are also present above the centre cogs and displayed in white. Along the bottom, there is a golden "THOMSUN ®" trademark logo, green arrow "→", "maxwell®" trademark in white, plus green "UD1" and "46" coding. The cassette release in Singapore comes in a deep blue/grey "wea SINGAPORE" engraved backed cassette case, the front and back cover artworks are similar to the US release, but the barcode shown on the back sleeve is printed instead in black. The US catalogue number 9 25733-4 is also displayed at the bottom of the spine. The inside of the folded insert folds out as usual to include the track lyrics, the colouring inside has also been printed in light grey rather than white, to made the images of the band members stand out clearer. The actual tape is again coloured the same deep blue/grey with black printed text to match the back of the cassette case. The title "A-HA STAY ON THESE ROADS" with the track listing underneath to each side is shown at the top. The "WB Records" logo is on the left hand side and Side 1/2 with the catalogue number 25733-4 is on the right hand side. There is some Production and Copyright information displayed at the bottom of each side; "(P)&© 1988 Warner Bros. Records Inc. for the US. ALL RIGHTS RESERVED. UNAUTHORISED COPYING PUBLIC PERFORMANCE BROADCASTING OF THIS RECORDING FORBIDDEN". The cover of the LP is similar to the UK release, but lighter in colour, it displays the title; "a-ha" in grey and "Stay on these roads" in white along the top. The catalogue number WBC 1641 is included in the bottom left hand corner printed also in white. The reverse of the sleeve comes with the regular blue track listing displayed in the centre, but Touchy! (like the UK edition) is printed without an exclamation mark, although its additionally included on the actual record label. The open hand and butterfly picture and text; "There’s never a forever thing" is handwritten as usual down the left hand side. A black barcode is included and displayed landscaped near the top left hand side. The catalogue number WBC 1641 is printed in black, along with it also being "Available on Cassette ZWBC 1641". There is a blue "WB Records" logo and text; "Also Available on Cassette and Compact Disc" shown at the lower half of the sleeve. At the bottom left hand corner, it includes the "TUSK" logo, printed in black, along with some marketing and copyright information; "Marketed by: Tusk Music Company (Pty) Ltd. All Rights Reserved – Unauthorized Duplication is a Violation of Applicable Laws". The "Interpok" logo is additionally shown at the bottom right hand corner. The inside of the LP comes with a stiff paper inner sleeve containing the regular track lyrics and artworks, the catalogue number is printed in the top left hand corner. The record itself comes with the standard colour artwork labels again similar to the UK release, the a-side is white with the open hand and butterfly picture on one half and the track listing for both sides displayed in blue on the other, the song credits are listed as ‘harket/mags/waaktaar’ compared to the UK/US release which has them shown as morten harket/mags/pal waaktaar. The catalogue number WBC 1641 is also displayed at the bottom again in blue. The b-side comes with the open hand and butterfly picture, blue "a-ha" logo and white title; "Stay on these roads", plus catalogue number. The cassette has a black front and back sleeve with the regular album artwork displayed in the centre, along the top there is a white banner which includes the catalogue number ZWBC 1641 and "TUSK Music Company" logo printed in black. At the bottom under the album artworks is the title "STAY ON THESE ROADS A-HA" and "DOLBY SYSTEM" printed in white on the black background, "cassette stereo tape" is also shown but again has been displayed in black on a white background. The spine is black with white text and displays the catalogue number at the top and the title at the bottom, there is also a large white barcode included in the centre of the spine which overlaps onto the back sleeve, it comes with a different number 6 001491 025842. The full track listing is shown on the back sleeve, printed in white and again on a black background. The inside of the insert is white with black text and again includes the title and catalogue number at the top with the full track listing underneath, some track credits and "Gallo" Record Company information is also included. On the inside of the back sleeve, it displays that the cassette was Marketed by: "Tusk Music Company (Pty) Ltd" and shows some copyright information; "All Rights Reserved – Unauthorised Duplication is a Violation of Applicable Laws". Some "Dolby B" text is also included. The "DOLBY SYSTEM" and "Interpak" logos are printed on the inside of the spine along with some "Please spool to end of the tape before playing other side." information. The tape is black with white printed text; the title is shown at the top along with some copyright information at the bottom. The catalogue number, "STEREO" and "(P) © 1988 Warner Bros." is also included. The Spanish LP comes with the same front cover as the UK/German edition displaying the a-ha logo in grey and the handwritten title "Stay on these roads" in white. On the reverse of the sleeve, the regular barcode is shown in the top right hand corner with the catalogue numbers for both the LP: 925733 Ⓛ and Cassette: 925733-4 Ⓜ printed underneath. The full track listing to each side is shown in the centre of the sleeve with the usual open hand and butterfly picture and text; "There’s never a forever thing" handwritten down the left hand side. At the bottom left hand corner, the usual "Warner Bros. Records Inc." contact address details is shown in black, along with the regular blue "WB Records" logo. The text; "Also Available on Cassette and Compact Disc" is printed in blue at the lower centre of the sleeve. There is also some Spanish manufacturing and distributing text displayed at the bottom centre in black which reads; "Edita: WEA RECORDS, S.A., C/ Condesa de Venadito 1-28027 MADRID a Warner Communications Company Distribuido por: DISCOS CBS, S.A. P° de la Castellana, 93-28046 MADRID Imprime: INDUGRAF MADRID, S.A. - Alcorcon (Madrid)". The record comes with the regular colour artwork labels again similar to the UK/German release, the a-side is white with the open hand and butterfly picture on one half and the track listing for both sides displayed in blue on the other, there is some additional Spanish manufacturing and copyright information printed in black and displayed around the outer edge of the label; "Prohibida la reproduccion, la ejecucion publica y la radiodifusion de este disco • Reservados todos los derechos • Fabricado en Espana por Discos CBS S.A. Madrid • Editado en Espana por WEA Records, S.A. Madrid". In the centre in-between the track listing there is some additional legal text printed in blue which reads; "Deposito Legal: M-12624-1988 SGAE". The b-side comes again with the regular open hand and butterfly picture, blue "a-ha" logo and white title; "Stay on these roads", plus Spanish catalogue number 925733-1. The release also includes an inner lyric sleeve. Promotional copies of the album come with a "Los Exidos de wea saltan a la vista" sticker and wea promo sheet. The Spanish cassette comes with the regular front and back cover artworks similar to the US release but the first edition doesn't include a barcode on the back sleeve. There is also some additional manufacturing and distributing information; "Edita WEA Records S.A. Condesa de Venadito, 1 - 28027-Madrid. A Warner Communications Company. Distribuido por DISCOS CBS, S.A. Paseo de la Castellana, 93. 28046 Madrid". On the spine the title "a-ha stay on these roads" is displayed in the centre with the usual "Warner Bros. Records" logo shown at the top and the regular US catalogue number 9 25733-4 included at the bottom. The "DOLBY SYSTEM" logo is additionally shown but includes the additional wording "ON LINEAR TRACKS" underneath. A circled Ⓜ symbol is also displayed. The inside of the insert folds out to include the regular full track lyrics and artworks. The "Warner Bros. Records Inc., a Warner Communications Company ® 3300 Warner Blvd, Burbank, Calif 91510" Record Company address is shown on the inside of the back sleeve but doesn't include the text "MADE IN U.S.A" and just leaves a gap. The "Dolby B" information is also displayed. Along the bottom of the inside of the back sleeve, there is some Spanish printing contact details; "Impreso por Graficas SANTOS. S.A. - San Romualdo, 26 - 28037 Madrid". The tape is white with black printed text and displays the title "A-HA - <>" at the top with the track listing to each side underneath. The catalogue number 925733-4 and some Production text; "(P) (C) 1988 WEA INTERNATIONAL Inc. A WARNER COMMUNICATIONS COMPANY" is displayed on the left of both sides, it also includes some additional text; "Dep. Legal: M. 12625-1988" (on side A only). On the right hand side of both sides; side A/B, "S.G.A.E. ", "STEREO" and the "DOLBY SYSTEM" logo is shown. Along the bottom of side A, there is some Spanish copyright information which reads; "Quedan reservados todos los derechos del productor fonografico y del propietario de la obra grabada. Salvo autorizacion, quedando prohibidos la duplicacion, alquiler y prestamo, asi como la utilizacion de esta cinta para la ejecucion publica y radiodifusion." and along the bottom of side B, there is instead some manufacturing and Record Company information; "Editado en Espana por WEA Records, S.A. Condesa de Venadito, 1, 28027 Madrid a Warner Communications Company Fabricado en Espana por Discos CBS, S.A.". The second pressing of the cassette is exactly the same as the first edition but now includes a black barcode on the back sleeve, the same catalogue number is used, but there is No "ON LINEAR TRACKS" text displayed under the "DOLBY SYSTEM" logo on the spine. The same white tape with black printed text is included and was again manufactured in Spain by "Discos CBS, S.A.". The Taiwan LP release is similar to the UK/German edition but comes with a slightly darker coloured sleeve. It was; "MADE BY UFO GROUP IN TAIWAN UNDER LICENSE". At the bottom left hand corner of the front sleeve printed in white, it displays the "UFO" and "wea® Warner/Elektral/Atlantic" logos along with the Taiwanese translation underneath. The back sleeve is white and includes the usual track listing in the centre and comes with the additional text; "Also Available on Cassette and Compact Disc" in blue underneath. The regular open hand picture with the butterfly and handwritten text; "There’s never a forever thing" is displayed down the left hand side. At the bottom left hand corner, the usual U.S. Record Company contact address and Copyright information is printed in black text and reads; "Warner Bros Records Inc., a Warner Communications Company ® 3300 Warner Blvd, Burbank, Calif. 91500. 75 Rockefeller Plaza, New York, New York 10019. © 1988 Warner Bros. Records Inc. for the U.S. and WEA International Inc. for the world outside of the U.S. ℗ 1988 Warner Bros. Records Inc. for the U.S. and WEA International Inc. for the world outside of the U.S. All Rights Reserved. Unauthorized duplication is a violation of applicable laws", but unlike the U.S. release, the text "Made in U.S.A" has been omitted and just leaves a gap in-between. The blue "WB Records" logo is also additionally included. Along the bottom centre of the back sleeve, it displays the Catalogue WU1348R in black, with the red and black "UFO" and "wea Warner/Elektra/Atlantic" logos, plus some manufacturing text, both printed in English and Taiwanese; "MADE BY UFO GROUP IN TAIWAN UNDER LICENSE". The inside of the LP comes instead with a 20cm square white lyric sheet with black printed text. The "UFO" logo and Catalogue number WU 1348 is displayed at the top left hand corner, next to the title; "A-HA STAY ON THESE ROADS" on one side, and the same manufacturing information and "UFO/wea" logos which appears on the back sleeve shown along the bottom of the other. The release also includes a mini black and white playing card displaying the "UFO" logo and other text in Taiwanese. The record itself comes with the exact same labels as the US release, displaying the regular standard artwork to include the full track listing printed in blue on one half of the a-side, and the picture of the butterfly on a hand on the other half. The "UFO" red and black logo, plus Taiwan Catalogue number WU 1348R has been additionally printed on the right hand side. The European re-pressed CD Album with matrix number (759925733-2.3 V01 OVB) on the disc was imported and used for the Taiwan release, it comes with an additional black Taiwanese obi-strip displaying the title in English on the front printed in a blue pastel coloured text. The Taiwan translation of a-ha is also shown in grey with the title in white on a purple background, both are additionally shown on the front and spine of the obi. The "UFO" logo is also displayed at the top of the obi spine with the "WB" logo and European catalogue number 7599-25733-2 at the bottom. Three of the singles; "Stay On These Roads", "Touchy" and "The Living Daylights" which are included on the album are printed in white and displayed in both English and Taiwanese at the bottom front of the obi-strip, there is some further Taiwanese text on the back displaying some of the bands earlier albums and hit singles. The disc is manufactured and imported from EU, but comes with a black Taiwanese obi-strip with white, grey and green text. The cassette comes with a folded insert which wraps right round the cassette. The front of the insert is black with the regular cover shot at the top and title in white underneath, the rest of the insert is silver with black, red and blue Taiwanese text plus track listing in English. At the bottom of the back cover, it displays that it was "MADE BY UFO GROUP IN TAIWAN UNDER LICENSE" and the back of the cassette case also comes with the "UFO GROUP CO. LTD." Logo engraved into the plastic. At the top of each spine, it displays the "UFO" logo along with an additional Taiwan catalogue number WU 1348, the regular catalogue number 25733-4 is shown at the bottom of the spines with the "Dolby" and "WB Records" logos Included. One of the spines shows the title in English, whilst the other has it printed in Taiwanese. The inside of the insert is white with a black and white shot of the band (Morten, Mags, Paul), in the picture Magne is wearing big glasses and has his eyes shut. The track list is printed in black with the usual "Warner Bros. Inc." Record Company and Copyright information included. The inside of the back cover also displays the "Dolby" information in Taiwanese and English. The cassette is black with silver/grey titles; it displays the "UFO" logo on the left with the Taiwan catalogue WU 1348 alongside. On the right, it shows the regular catalogue number 25733-4, along with the "Dolby" and "WB Records" logos. The "MADE BY UFO GROUP IN TAIWAN UNDER LICENSE" manufacturing information in displayed along the bottom in both Taiwan and English. The cassette also comes with a white folded paper lyric sheet. The Thailand cassette comes with the same front and back cover artworks as the US release, but the colouring on the back sleeve has been printed slightly darker. There is no Catalogue number displayed on the spine, or barcode shown on the back sleeve. The insert folds out to include the regular layout with track lyrics. There is an additional large "Warner Bros. Records" logo printed on side one within the track lyrics. On the inside of the back sleeve, it displays the usual "Warner Bros. Records Inc." contact address and copyright information, but the text "MADE IN U.S.A." has been omitted, leaving a gap in between. The tape is light grey and comes with a white stick-on label with black printed text. The title "A-HA • STAY ON THESE ROADS" with the track listing to each side underneath is displayed at the top. The "WB Records" logo and catalogue number 25733-4 is shown on the left hand side and a large 1 or 2 on the right hand side. There is some production text at the bottom; "PRODUCED BY ALAN TARNEY (P) & © 1988 Warner Bros. Records Inc". Also engraved into the actual plastic of the tape at the top right hand corner of side one and on the back of the cassette case itself is the "wea" logo. The cover of the Uruguay cassette is black with a square purple-tone picture as found on the European releases. The spine and front cover have a white a-ha logo and the title is printed in purple. A large gold colour circled "32" is printed at the bottom of the spine. The lyrics are not printed on the cover, just a basic track list printed on a white background. The cassette is white with light blue labels with black text. This release doesn't look very official - to be confirmed. The US LP release comes with a slightly darker cover than the German made UK edition, the title "a-ha stay on these roads" has been printed slightly lower down on the front sleeve. On the reverse of the sleeve, the usual track listing is shown in blue with the regular artworks displaying the open hand with the butterfly and text; "There’s never a forever thing" down the left hand side. The black barcode is displayed in the top right hand corner but unlike the UK release, it doesn’t show any catalogue numbers. At the bottom left hand side, the regular "WB" Record Company and Copyright information is shown which additionally now includes "Made in U.S.A", it reads; "Warner Bros. Records Inc., a Warner Communications Company ® 3300 Warner Blvd., Burbank, Calif. 91510. 75 Rockefeller Plaza, New York, New York 10019 © 1988 Warner Bros. Records Inc. for the U.S. and WEA International Inc. for the world outside of the U.S. ℗ 1988 Warner Bros. Records Inc. for the U.S. and WEA International Inc. for the world outside of the U.S. Made in U.S.A. All Rights Reserved. Unauthorized duplication is a violation of applicable laws". Also included on the back sleeve is the blue "WB Records" logo and the text; "Also Available on Cassette and Compact Disc". The labels on the record comes with the standard artwork similar to the UK release, to include the full track listing printed in blue on one half of the a-side, and the picture of the butterfly on a hand on the other half. Unlike the UK release, there is no Copyright information displayed, plus the "STEREO" or "GEMA/BIEM" logos have been removed, the catalogue number 1-25733 has also been changed and is now displayed at the bottom edge. The b-side of the label includes the colour picture of the butterfly in hand, blue "a-ha" logo and white handwritten title; "Stay on these roads". The revised catalogue number is again shown at the bottom edge in white. The release also comes with the regular inner lyric sleeve but includes some additional text to show that it was "Made in U.S.A" and displays the catalogue number 9 25733-1. Promotional copies of the LP additionally come with some Gold text printed at the bottom left hand corner of the front sleeve to read; "Lent for Promotional Use Only. Any Sale or Unauthorized Transfer is Prohibited and Void. Subject to Return Upon Demand by Owner. Acceptance of This Record Constitutes Agreement to the Above". Some copies of the CD come in a long box. The US first CD edition was released by "Warner Brothers" and comes with the regular artworks and colour booklet; it was "Made by WEA Manufacturing" and is similar to the European release. The same production and copyright information is used on the back sleeve, but it additionally shows that it was "Printed in U.S.A.", unlike the European release, there is no catalogue number displayed in the top right hand corner. The actual disc is silver with black text and includes the regular layout, but comes with some additional production and copyright information displayed on the left hand side, rather than around the outer rim, it reads; "(P) 1988 Warner Bros. Records Inc. for the U.S., a Warner Communications Company. All Rights Reserved. Unauthorised duplication is a violation of applicable laws. Mfg. by WEA Manufacturing". At the bottom of the disc, the "WB Records" logo is displayed in light blue, rather than in navy and it also has printed that the disc was "MADE IN USA". The catalogue number has been changed to 9 25733-2. There is another US CD pressing which was again released by "Warner Brothers" and comes with the same catalogue number, but the disc was instead "Manufactured by Discovery Systems". The front and back cover sleeves are exactly the same as the previous US "WEA Manufacturing" edition, but the production and copyright information on the left hand side of the disc has been slightly amended to now read; "Mfg. by Discovery Systems". The layout of the disc is otherwise exactly the same as the earlier edition with the "MADE IN USA" again being displayed at the bottom. The text "MADE BY DISCOVERY SYSTEMS – AN AMERICAN COMPANY 2UD0100A" is additionally engraved round the centre ring of the disc. There is a promo picture CD-album of "Stay On These Roads" which features a picture of a butterfly resting on a hand in the lower part, the a-ha logo in white across the middle section of the CD plus the title and the song credits placed in an arc around the disc. A gold disc edition also exists. The USA cassette edition was manufactured at "Warner Bros. Records Inc., a Warner Communications Company ® 3300 Warner Blvd., Burbank, Calif. 91510 • Made in U.S.A.". The front and back cover artworks are similar to the UK release, but the catalogue number on the spine has been changed to 9 25733-4. There is some additional Dolby "B" text included on the inside of the back sleeve. The inside of the folded insert is light grey (rather than white) and includes the regular artworks and full track lyrics. The tape is transparent clear with a grey centre piece and white printed text. The title "a-ha/Stay On These Roads" is shown at the top with the track listing to each side underneath. the "Warner Brothers" logo and different catalogue number 4-25733 is displayed on the left with side 1/2 on the right, some copies also include either an "SR" or "AR" printed underneath side 1/2 on the right hand side. Along the bottom of side 1, it displays some Production text; "Produced by Alan Tarney ⓟ 1988 Warner Bros. Records Inc. for the U.S. "and along the bottom of side 2, it shows the Record Company address; "A Warner Communications Company ® Warner Bros. Records Inc. 3300 Warner Blvd., Burbank, Calif. 91510 • Made in U.S.A.". 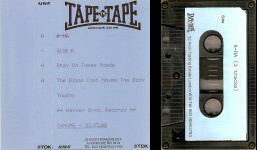 There is an Indiana cassette release of "Stay On These Roads" which was Manufactured in the USA, it is very similar to the Warner Brothers pressing and comes with the same front and back cover artworks, and also includes the folded insert containing all the track lyrics, it additionally has printed over the bottom of the front cover artworks in white text some Manufacturing information; "Mfd. for BMG Direct Marketing, Inc. under License 6550 East 30th Street, Indianapolis, Indiana 46219". The Catalogue number C100490 is also displayed in white on the front cover and in black text on the actual spine. The tape itself is white with black text, the layout and design is again very similar to the US pressing, but the Manufacturing information displayed along the bottom of side 2 is different, it reads; "Mfd for RCA Music Service under License". On the left hand side the Catalogue number C100490 has again been additionally displayed. The LP release comes with the regular front and back cover artworks similar to the U.S. pressing. There is no barcode shown on the back cover and the release doesn't include an inner lyric sleeve. The full track listing is shown as usual in the centre with a blue "WB Records" logo displayed further down on the lower left. The regular open hand with the butterfly picture and handwritten text; "There's never a forever thing" is displayed down the left hand side. There is some Spanish manufacturing and distributing information displayed at the bottom of the back cover again in blue which reads; "Hecho en Venezuela por Roden Discos y Distribuido por WEA de Venezuela". Both the "Rodven Discos" and "wea" logos are also included alongside. There is also some copyright and legal text shown; "Prohibida la reproduccion, localizacion (alquiler) y prestamo de este ejemplar y su radiodifusion o ejecucion publica. Reservados todos los derechos de los autores de las obras y del productor de fonogramas". "DEP. LEGAL nb-88-4040. Nº ORIG 25733. ℗ 1988 Wea International Inc. © 1988 Wea de Venezuela, C.A.". 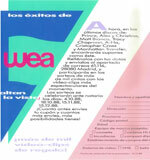 At the top right hand corner of the back cover, it includes the "wea" logo and catalogue number 3235 printed in blue. The label on the record is coloured pink and differs from the regular artwork design, it displays a large colour "WB" logo at the top with the title "A-HA STAY ON THESE ROADS" printed in black underneath. The track listing to each side is also included and is displayed both in English and Spanish along with track credits and track lengths. The catalogue number; "WARNER 3235" is displayed on the left and "℗ 1988" on the right. Additionally around the bottom edge of the label on both sides is some manufacturing and copyright text; "HECHO POR WEA VENEZUELA S.A. RESERVADOS TODOS LOS DERECHOS DEL PRODUCTOR FONOGRAFICO DE LAS OBRAS GRABADAS EN ESTE DISCO. PROHIBIDA SU REPRODUCCION, EJECUCION Y UTILIZACION PUBLICA". The cassette release was manufactured by "Rodven" and was distributed by "WEA", it comes with a black tape with grey printed text. The title "STAY ON THESE ROADS / A-HA" is displayed at the top with the track listing to each side underneath. On the left hand side, it displays the "WB Records" logo, with side 1/2 and the catalogue number 3235 shown on the right. Along the bottom in the left hand corner it includes some manufacturing information; "Hecho en Venezuela por Rodven Discos DL-nb-88-4041", with some other Spanish Copyright information shown at the bottom right; "Reservados todos los derechos del productor fonografico y de los autores de los obras registradas en esta cinta. Prohibida su reproduccion ejecucion publica y-O radioteledifusion". The front and back cover insert is black and displays a rather darker image of the usual LP album artworks; the title is printed underneath in large white uppercase letters along with the usual "wea" logo. On the spine, the title "A-HA STAY ON THESE ROADS" is displayed landscaped at the top again with the "wea" logo and catalogue number shown orientated at the bottom. The back sleeve also shows the full track listing to each side, with side A/B being printed in Spanish to read "LADO A" and "LADO B". There is also some Spanish manufacturing and distributing information; "Hecho en Venezuela por Rodven Discos y distribuido por Wea de Venezuela". The inside of the insert is white with black text and folds out single-fold to include the title at the top and full track listing underneath, printed in both English and Spanish, along with track credits and track lengths. There is some Production information; "℗ 1988 Wea International, Inc." and Copyright text; "© 1988 Wea de Venezuela, C.A." included. The Yugoslavian LP was pressed by "Jugoton" and is like the German made UK release, coming with the same blue coloured front sleeve displaying the picture of a-ha with broken glass and string. The regular handwritten title "a-ha stay on these roads" is printed in grey along the top. On the back sleeve, the regular album layout is included, showing the full track listing in blue down the centre of the sleeve, and usual picture of the open hand with the butterfly and handwritten text; "There’s never a forever thing" printed down the left-hand side. At the top right-hand corner, the regular barcode number "0 7599-25733-1 3" which appears on the German made UK edition is shown, along with the same German Catalogue number 925733-1 printed underneath, both Catalogue numbers for the Yugoslavian LP LSWB 78061 and Cassette CAWB 9335 releases have now been included. At the lower left of the sleeve is the usual "Warner Bros. Records Inc." Record Company contact address and copyright information which reads; "Warner Bros. Records Inc., a Warner Communications Company ® 3300 Warner Blvd., Burbank. Calif. 91510. 75 Rockefeller Plaza, New York, New York 10019. © 1988 Warner Bros. Records Inc. for the world outside of the U.S. ℗ 1988 Warner Bros. Records Inc. for the world outside of the U.S. All rights Reserved. Unauthorized duplication is a violation of applicable laws". The regular blue "WB RECORDS" logo is also present alongside it. Additionally, along the bottom of the sleeve is a black "Jugoton" logo and some Croatian manufacturing information (again printed in black and displayed in bold); "radna organizacija za nakladu nosilaca zvuka I slike p.o. ZAGREB – Niska b.b. Made in YUGOSLAVIA". Some other Croatian Editorial text is also included; "Urednik redakcije: Veljko Despot Glavni i odgovorni urednik: Sinisa Skarica". The inside of the sleeve comes with the same inner sleeve as the German made UK edition, but the Catalogue number has been changed to LSWB 78061. The record itself comes with the same colour labels which are again virtually the same as the regular German made UK edition, displaying the standard artwork and including the full track listing printed in blue on one half of the a-side, and the picture of the butterfly on a hand on the other half. On the right-hand side of the a-side, the Catalogue number has been amended to include the Yugoslavian Catalogue number "LSWB 78061 A" and side reference, printed in light blue. At the bottom of the b-side, the Catalogue number has instead been printed in black to show "LSWB 78061 B". The Yugoslavian cassette comes with virtually the same front and back cover insert to the European release, the regular artworks on the front cover is also coloured slightly purple compared to the usual dark blue. At the bottom of the spine it includes a "Jugoton" logo along with the Catalogue number CAWB 9335 printed in white. On the inside of the back sleeve, it folds out to include the usual full track lyrics, but there is some additional Croatian text on the inside of the back cover which reads; "Takoder I na LP ploci LSWB 78061 Urednik redakcije: Veljko Despot Glavni I odgovorni urednik: Sinisa Skarica", it translates to "also being available on LP and gives credits to the chief Editor: Sinisa Scissors". The tape is black with an orange stick-on label and black text, it includes the title "STAY ON THESE ROADS" at the top with a-ha and "WARNER/JUGOTON" underneath. On the left hand side which is separated by a continuous dashed line, it displays the "Jugoton" logo along with "STEREO" and the Catalogue number CAMB 9335, "BIEM" and "SOKOJ" are also shown. At the bottom left hand corner it displays that the tape was "Made in Yugoslavia". Along the bottom of each side there is some Croatian Copyright information which reads; "Sva prava proizvodaca vrpca I vlasnika snimljenog djela pridrzana. Zabranjuje se presnimavanje, javno izvodenje I radiodifuzija ove vrpce". The Zimbabwean LP release of "Stay on these Roads" comes with a similar layout to the South African edition. The front cover artworks is the same but the sleeve has a more matt finish rather than being shiny. On the reverse of the sleeve, the usual track listing is displayed in the centre printed in blue with the text; "Also Available on Cassette and Compact Disc" included underneath. The regular open hand picture with the butterfly and handwritten text; "There’s never a forever thing" is shown as usual down the left hand side. Included at the top left hand corner above the artwork picture is the same barcode which is present on the South African LP, plus displayed at the top right hand corner is also the same Catalogue number WBC 1641 and that the album was "Available on Cassette ZWBC 1641". At the bottom left hand corner printed in black is some Marketing and Copyright information; "MARKETED BY GAMMA RECORDS All Rights Reserved – Unauthorised Duplication is a Violation of Applicable Laws". The blue "WB RECORDS" logo is also shown on the back sleeve along with the wording "Bardwell" in black at the bottom right hand corner which refers to be the name of the printing Company. The record itself comes with black and white labels rather than colour, showing a slightly different layout compared to the South African release. The "WB Records" logo as usual has been displayed above the centre ring, but shown slightly smaller, plus the Copyright information printed around the outer top edge is worded slightly differently and printed in lower case lettering; "All rights of the Record Producer and of the owner of the work reproduced reserved. Copying, Public Performance and Broadcasting of this record prohibited". The record also shows above the "WB" logo (in bold) that it was "Manufactured by TEAL Record Company". On the left hand side of each side, the running speed of 33.3 RPM, Catalogue number WBC 1641 and SIDE 1 or 2 are shown, with the record Company text; "1-5 Gallo" being displayed on side 1 and "1 Gallo United Lion Music 2-5 Gallo" instead printed on side 2. The Catalogue Number WBC 1641 has again been included on the right hand side, but printed much larger. The title itself "STAY ON THESE ROADS" with a-ah (spelt incorrectly) is shown at the lower half of the centre ring with the full track listing to each side underneath, the track lengths and track credits are also included. The release unlike the South African pressing doesn’t appear to include an inner lyric sheet.